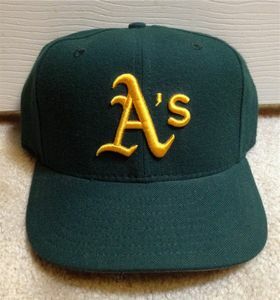 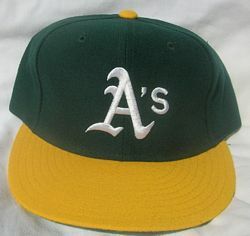 The Athletics reinstate the "A" insignia on the caps in place of the "KC". 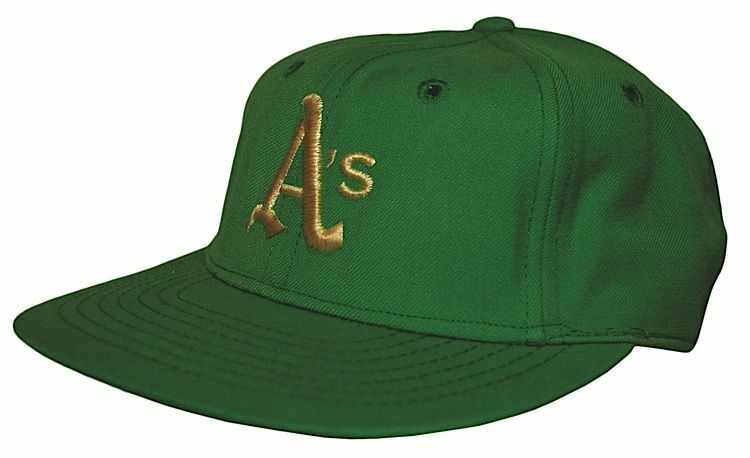 For one season caps return to the darker green worn in Kansas City from 1963-65. 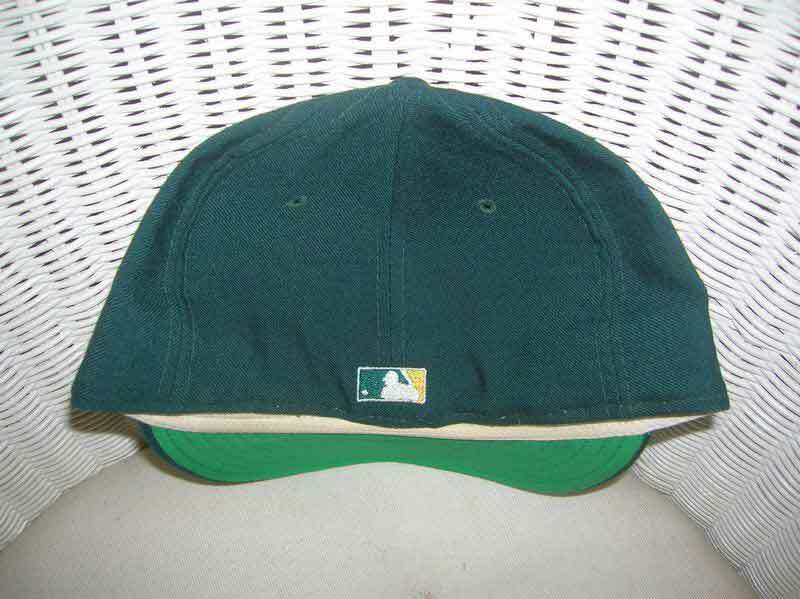 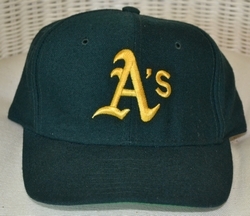 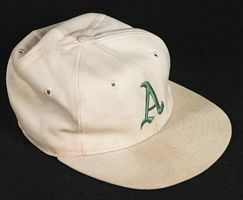 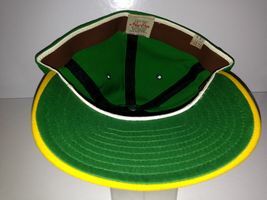 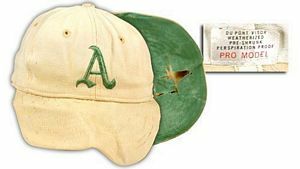 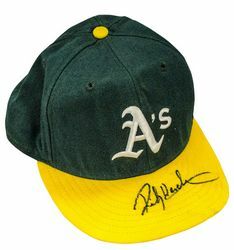 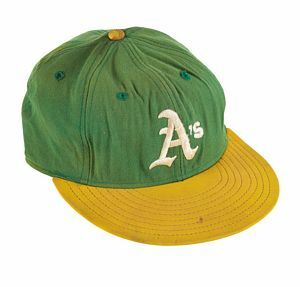 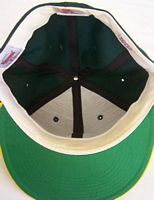 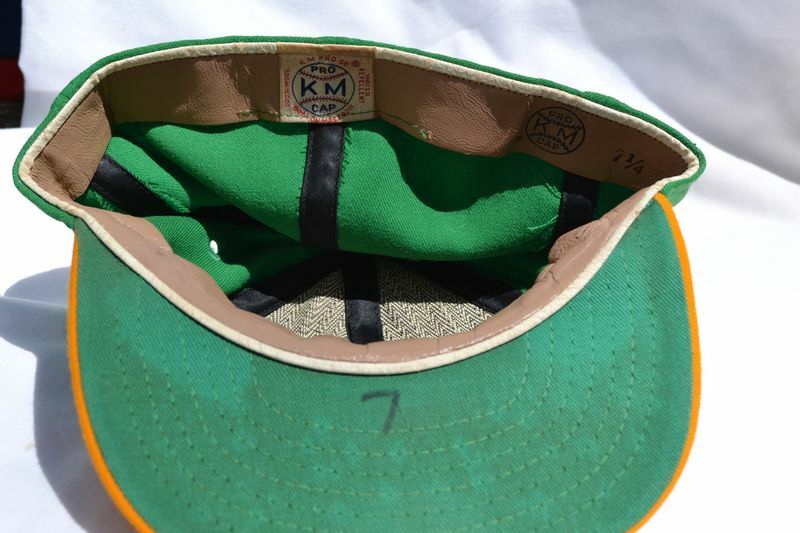 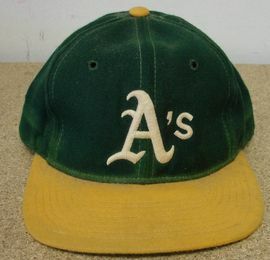 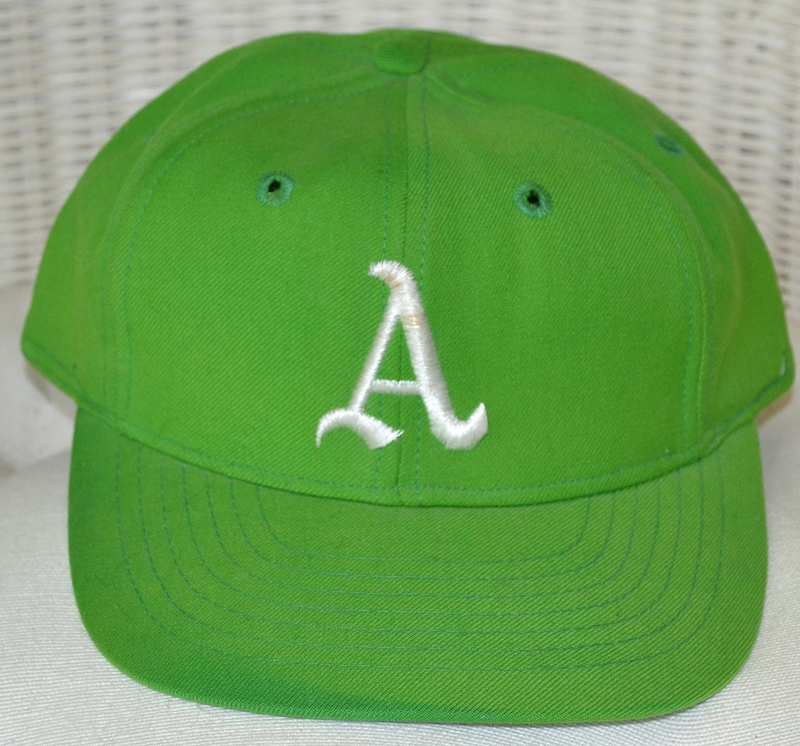 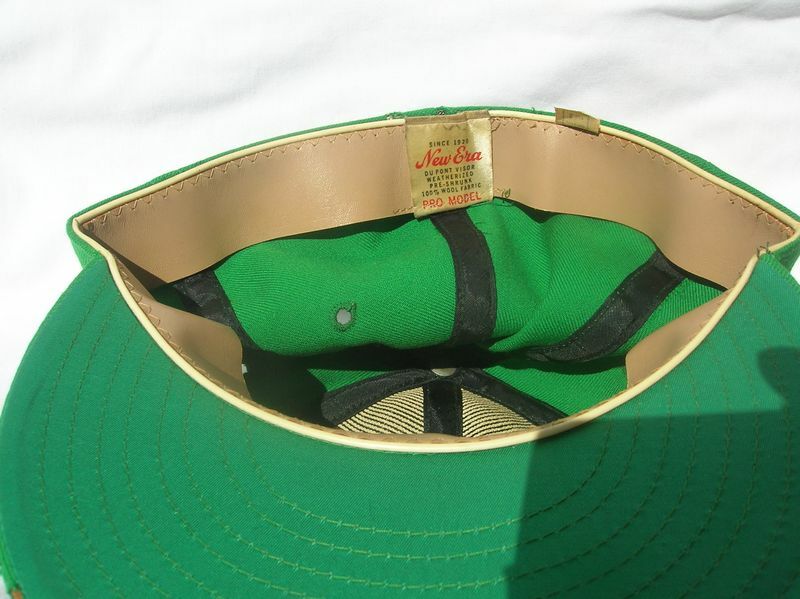 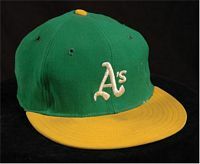 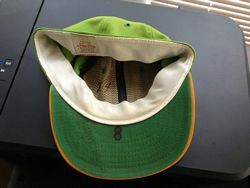 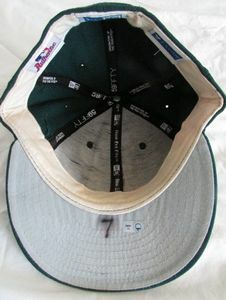 The Athletics wear McAuliffe/KM Pro and New Era (McAuliffe closed after the 1968 season but McAuliffe-labelled caps had been made for the '69 season). The color returns to the lime worn in KC 1966-67, and the logo gets a new shape. A gold alternate cap is used on occasion. 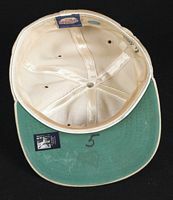 As in Kansas City, white coaches caps were used. The tail on the A is slightly different on New Era caps. Charles Finley officially changes the name to A's. 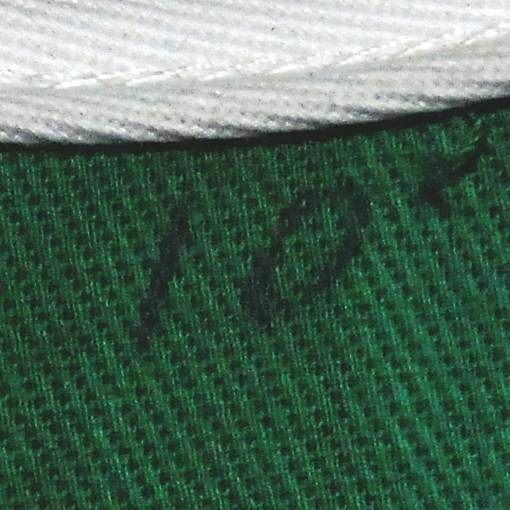 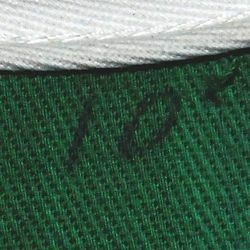 An apostrophe "s" is added to existing jerseys and caps. 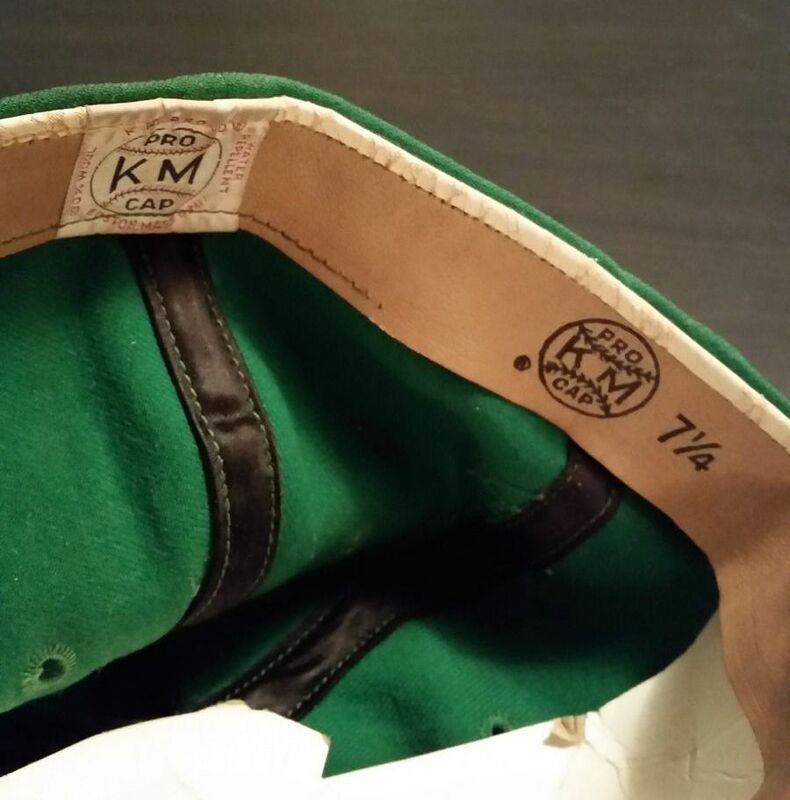 Both New Era and KM Pro are worn. 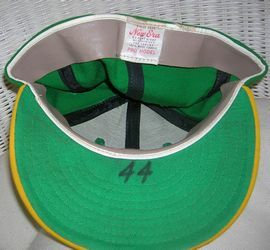 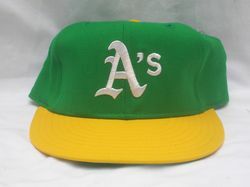 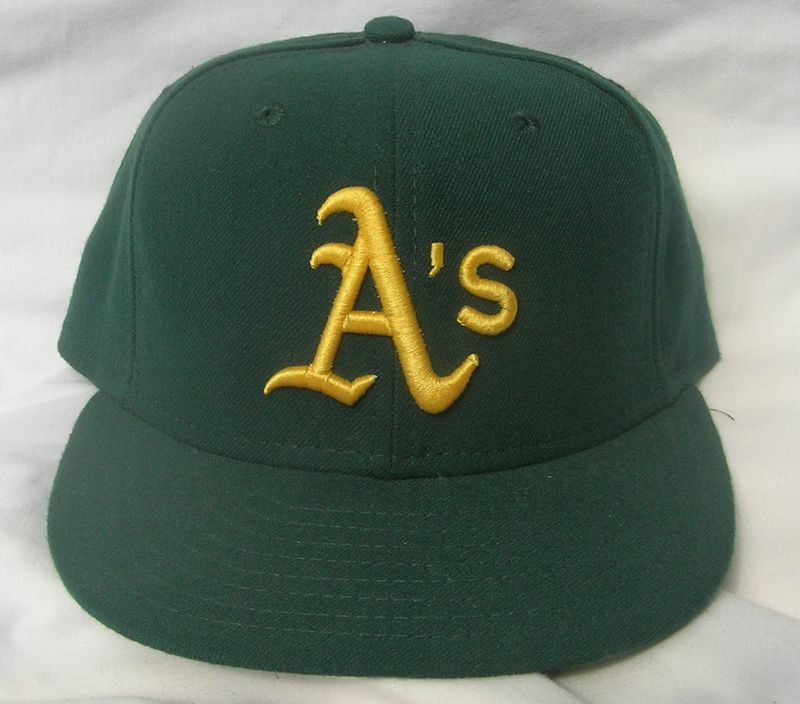 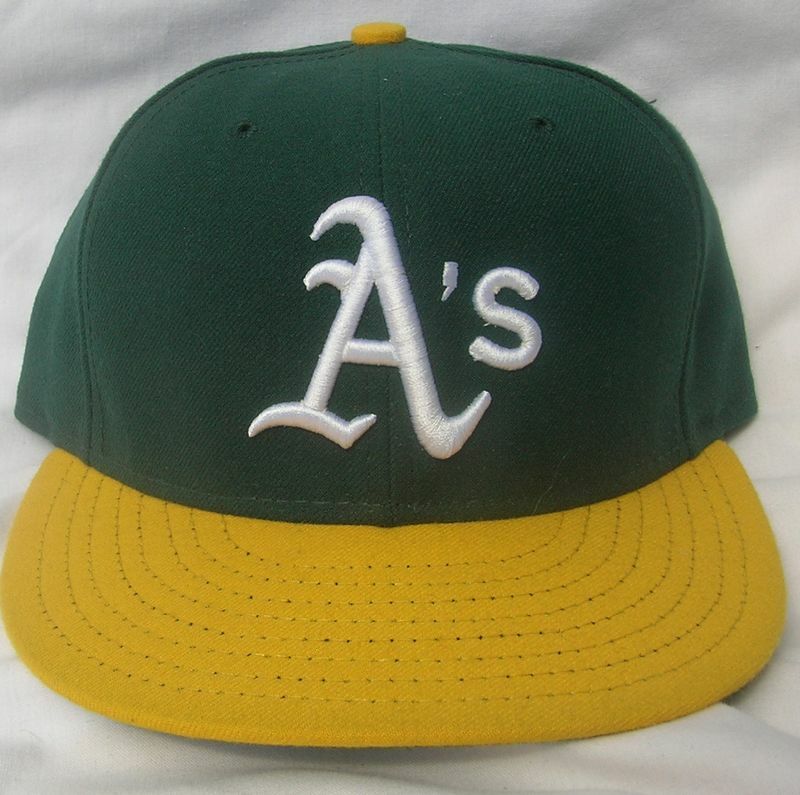 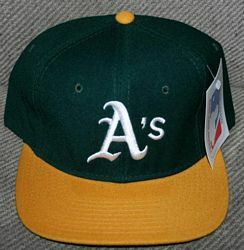 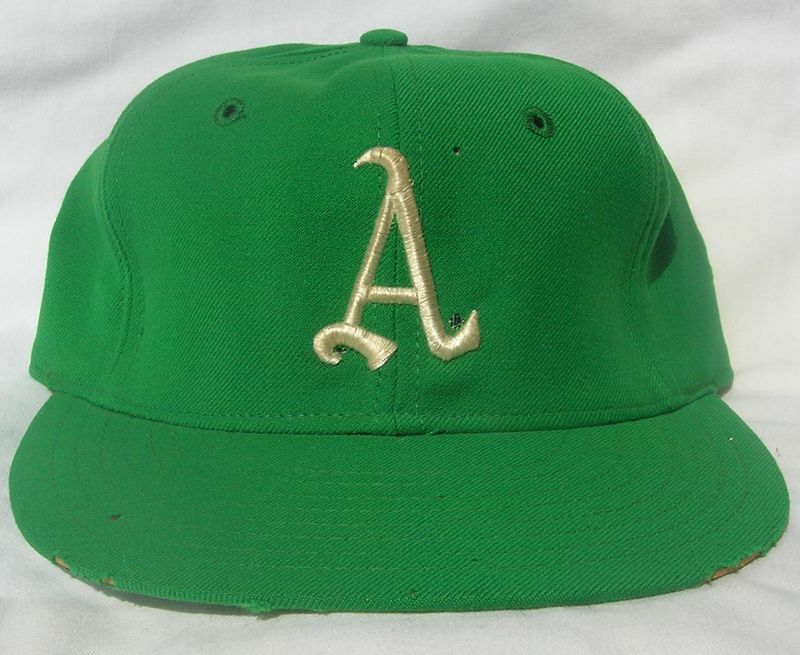 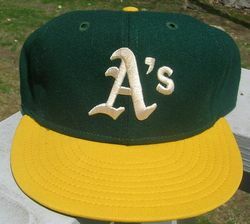 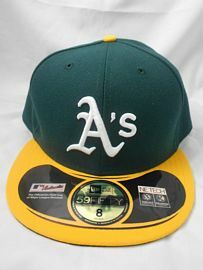 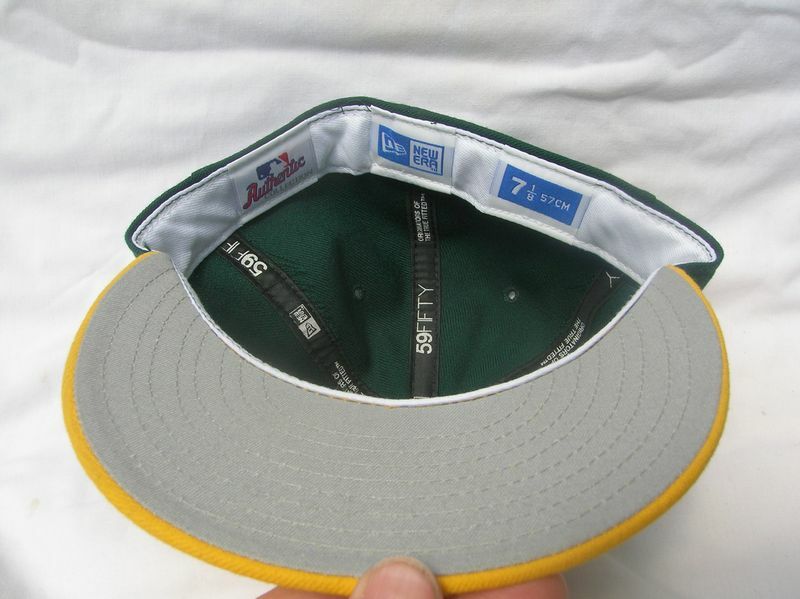 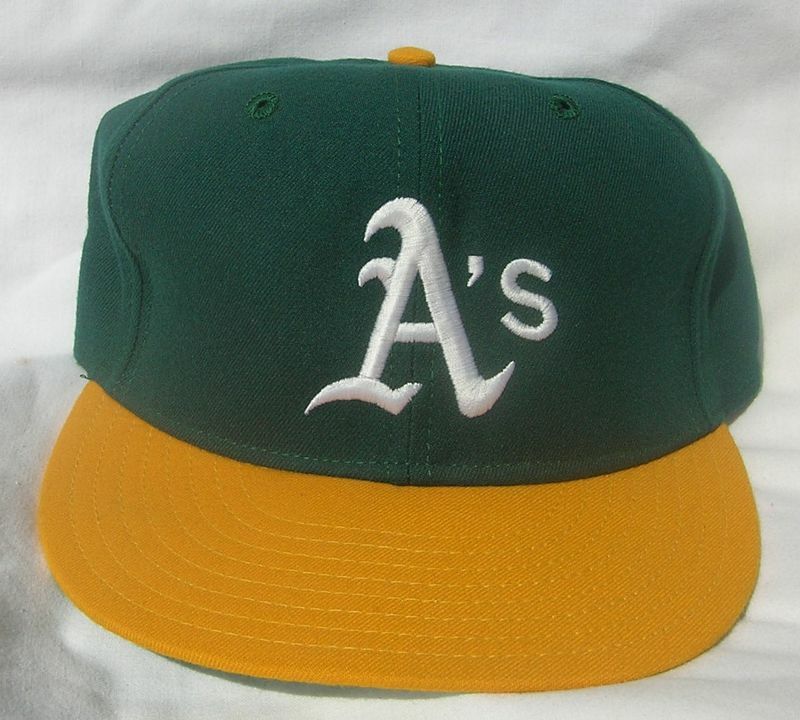 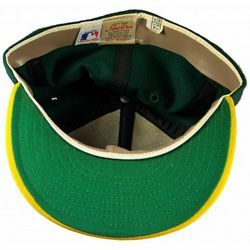 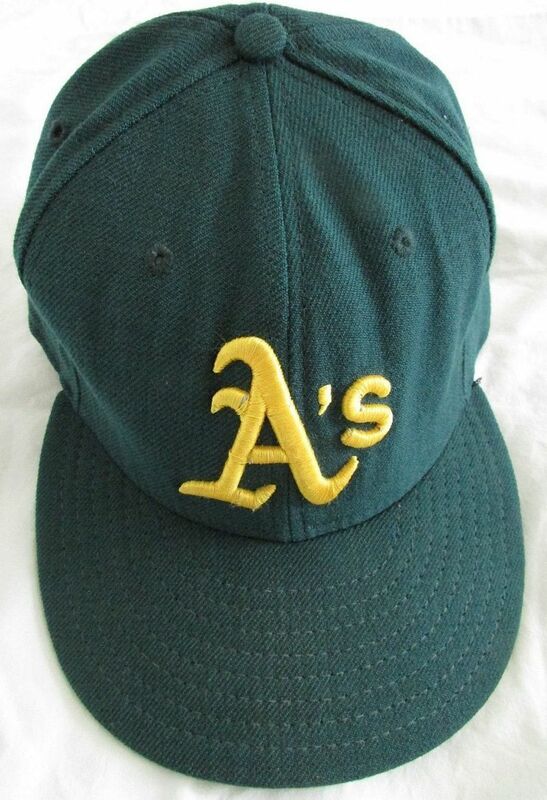 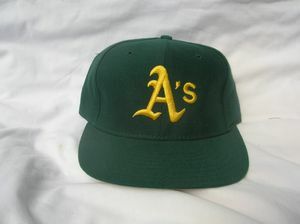 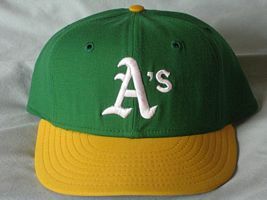 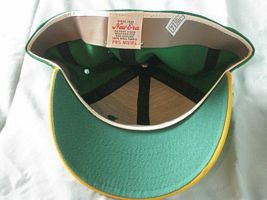 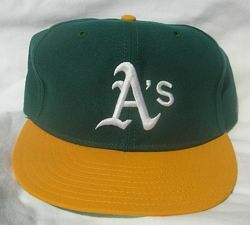 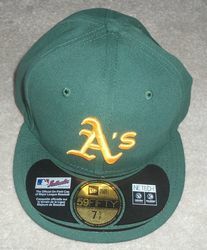 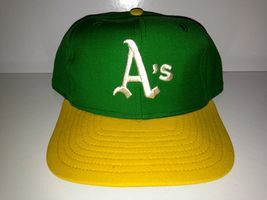 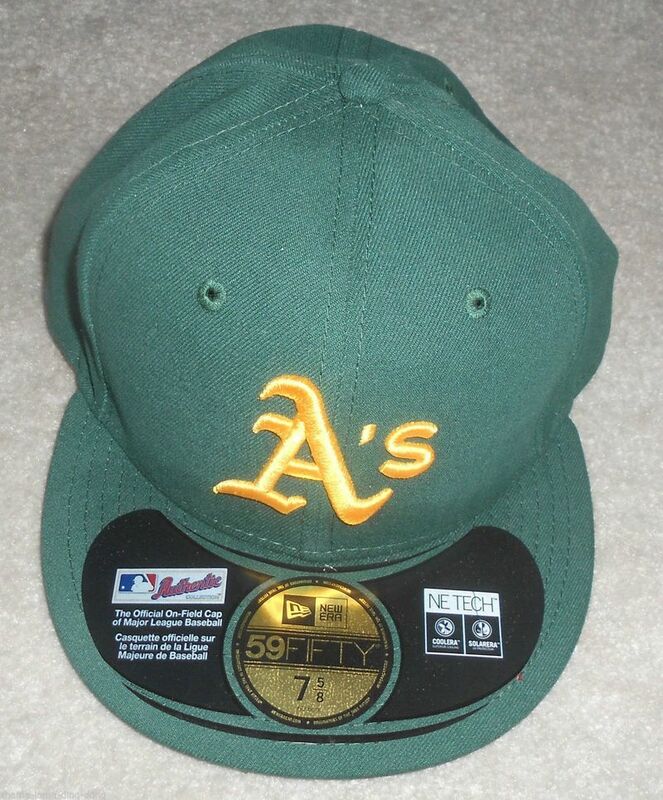 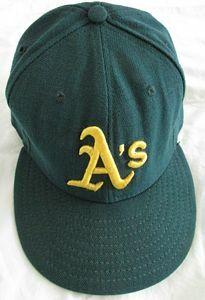 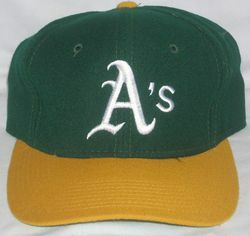 The A's change to their now-classic green with gold visor and button. 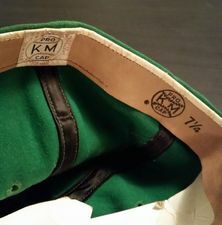 Looks like KM Pro were used first, but New Era took over. 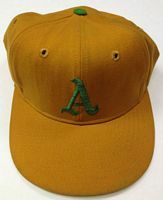 The New Era gold is more yellow, the "A" is thicker and has a sharper tail. 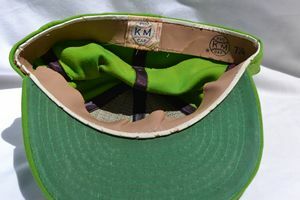 This is exactly the same as the KM Pro above but with a New Era tag. Looks like New Era bought these from Leslie Co. and tagged them as their own. 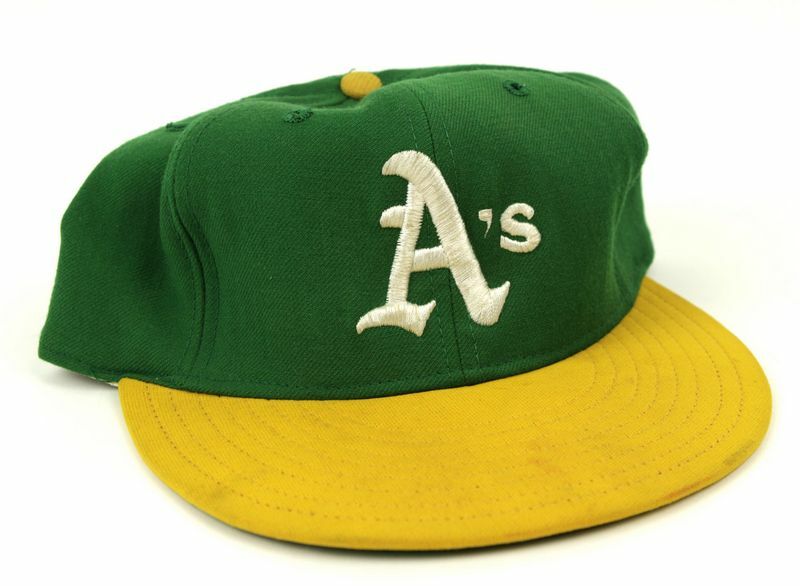 By late season 1971, this model takes over. The logo is a bit different, and the gold color is closer to yellow. 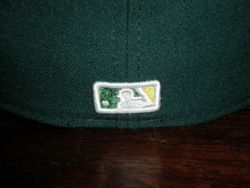 ...and here's the one that looks like the jersey logo. 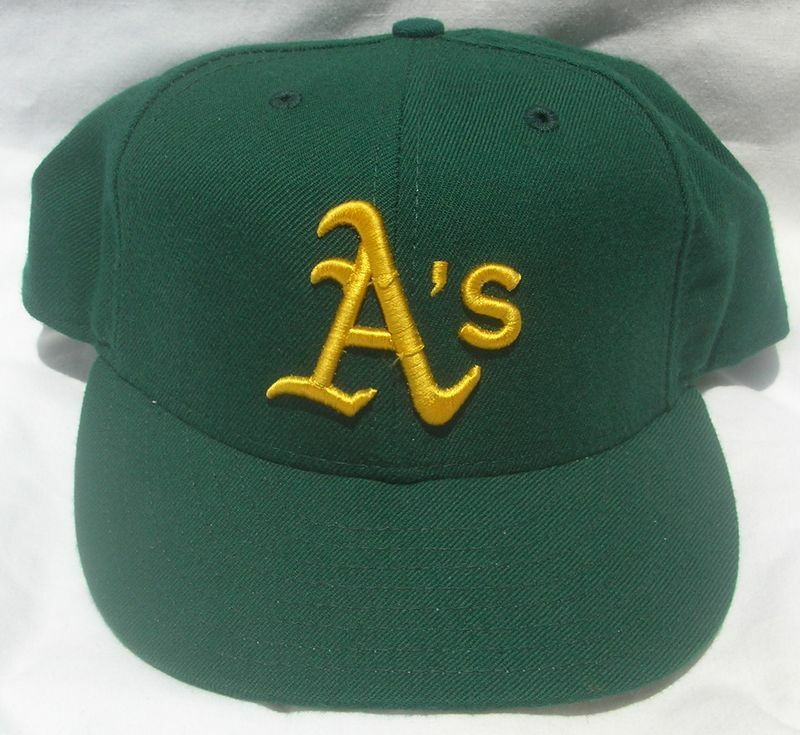 In 1973 the logo gets thicker and a second serif is added reminiscent of the Philadelphia Athletics of the 1950's. 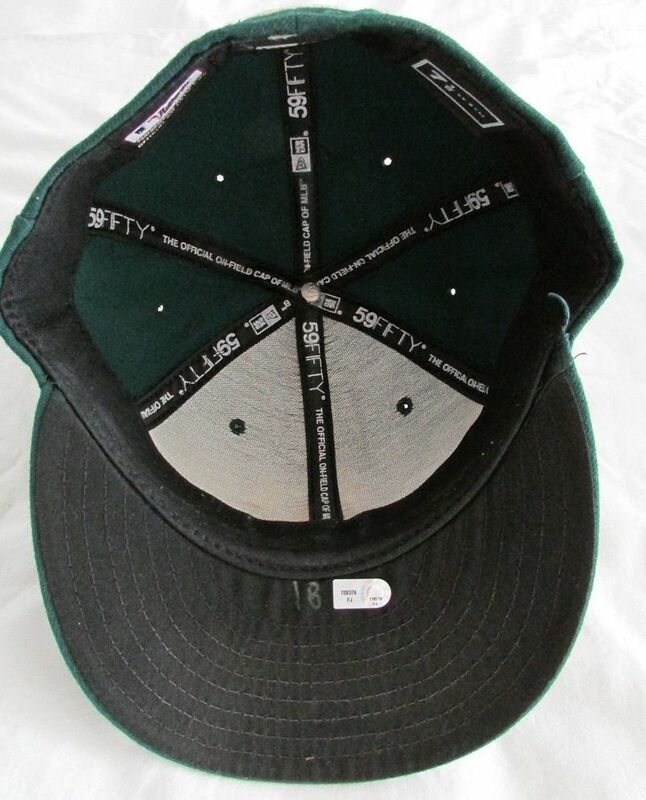 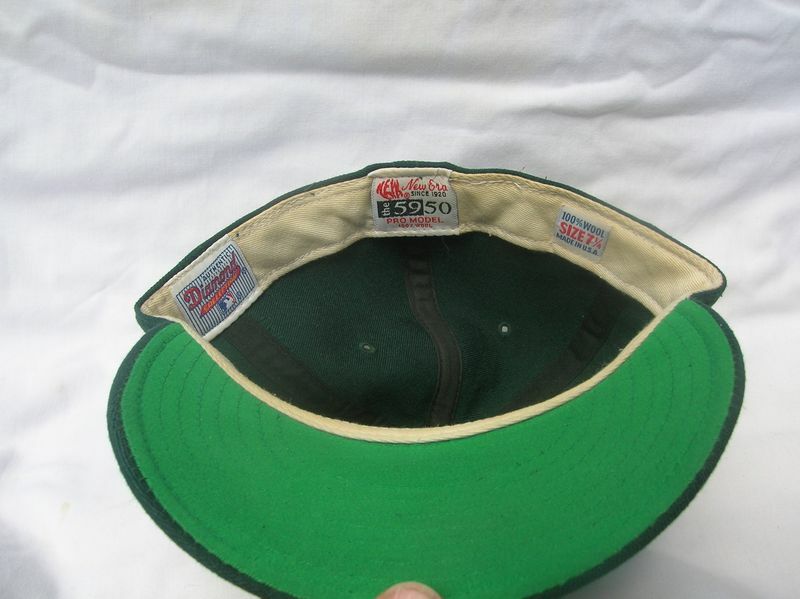 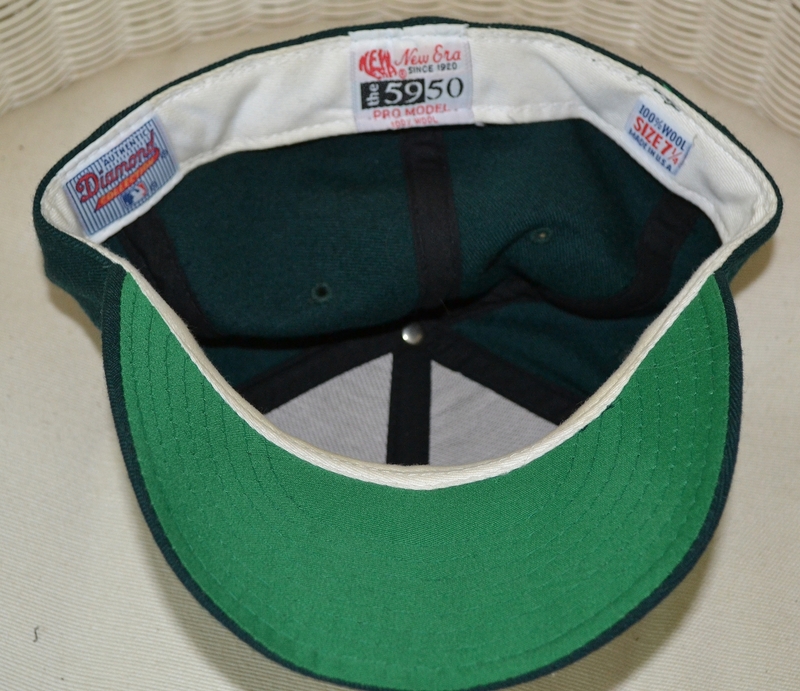 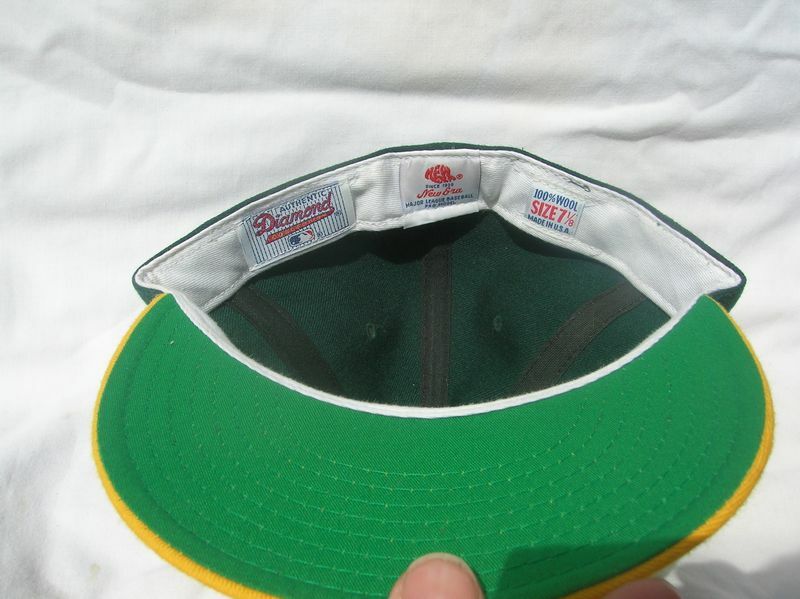 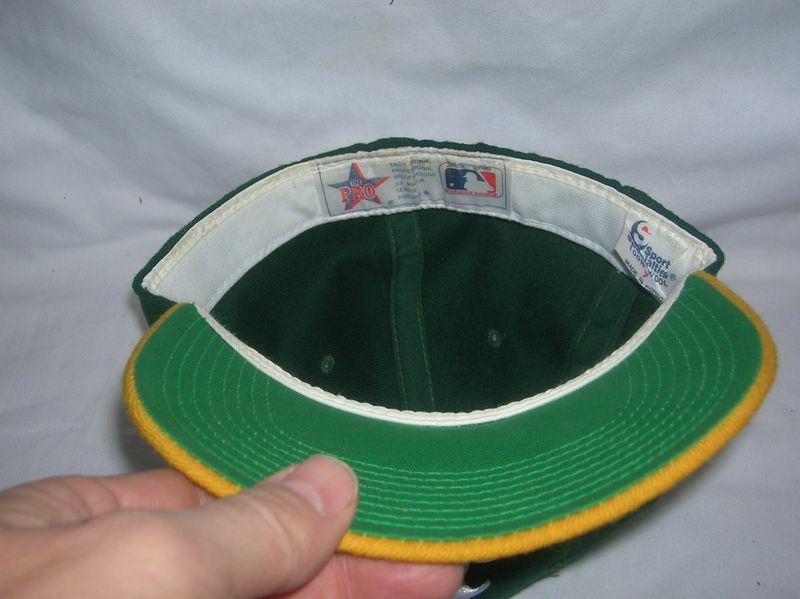 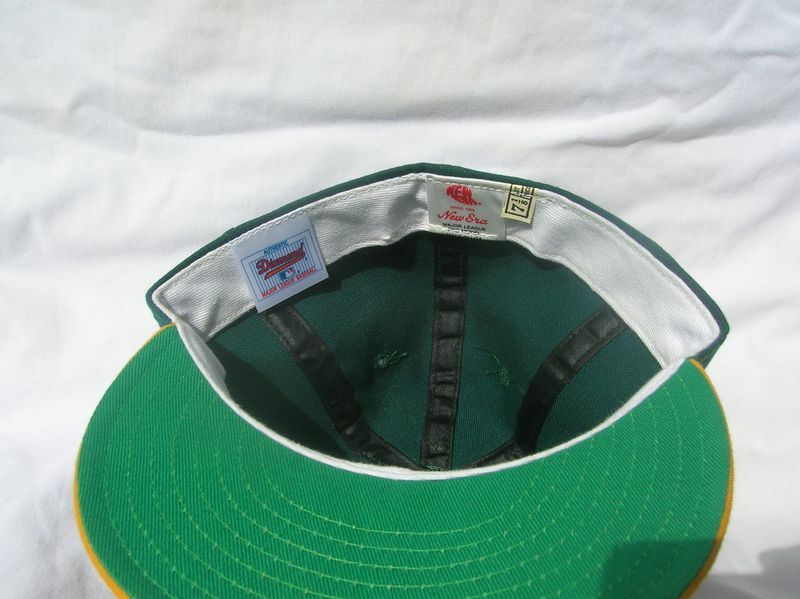 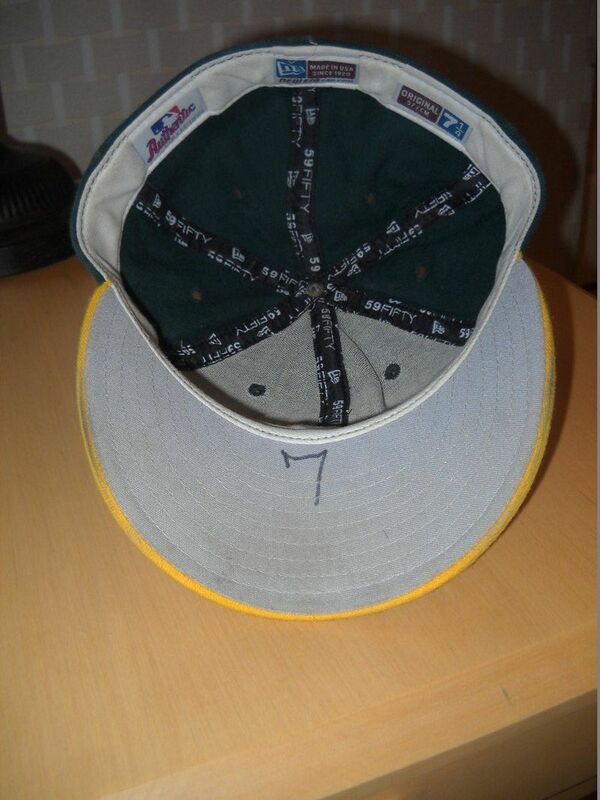 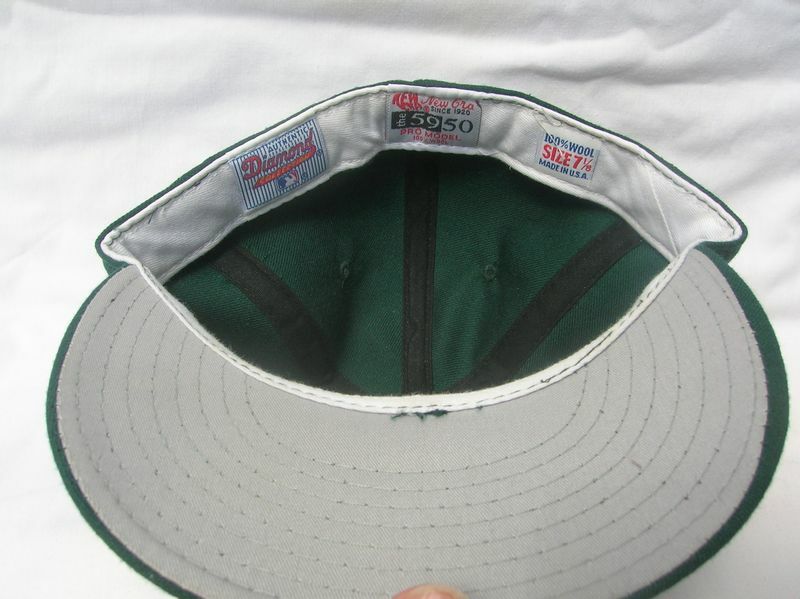 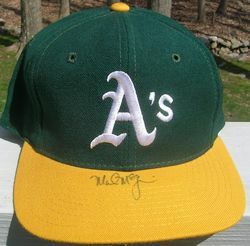 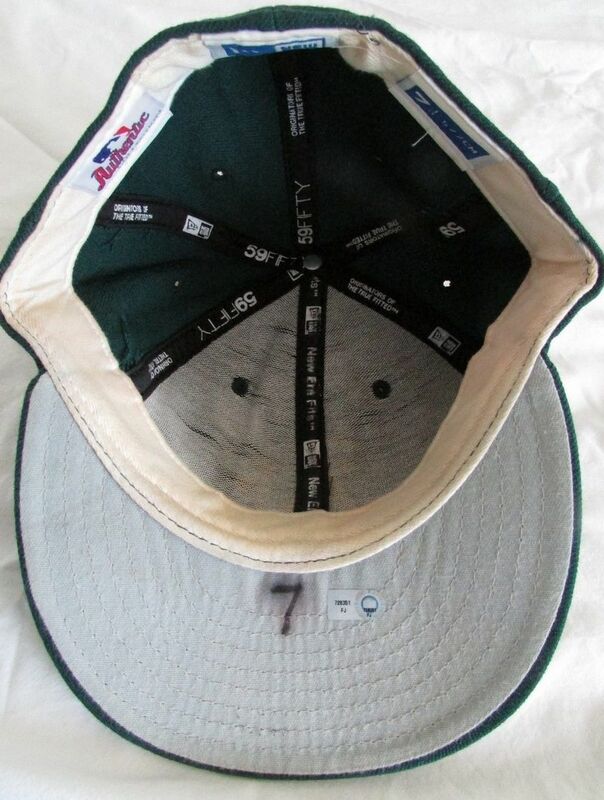 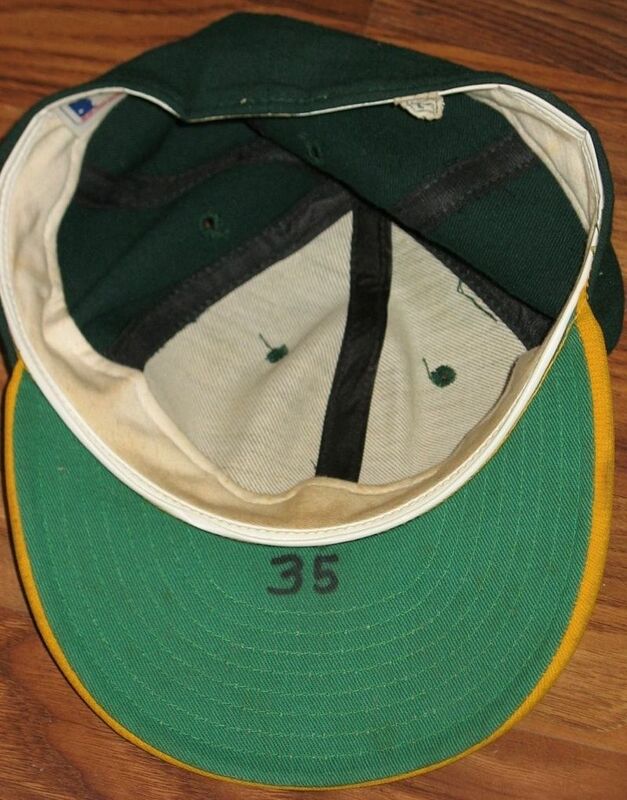 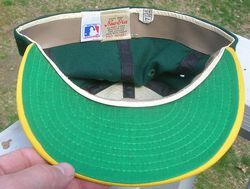 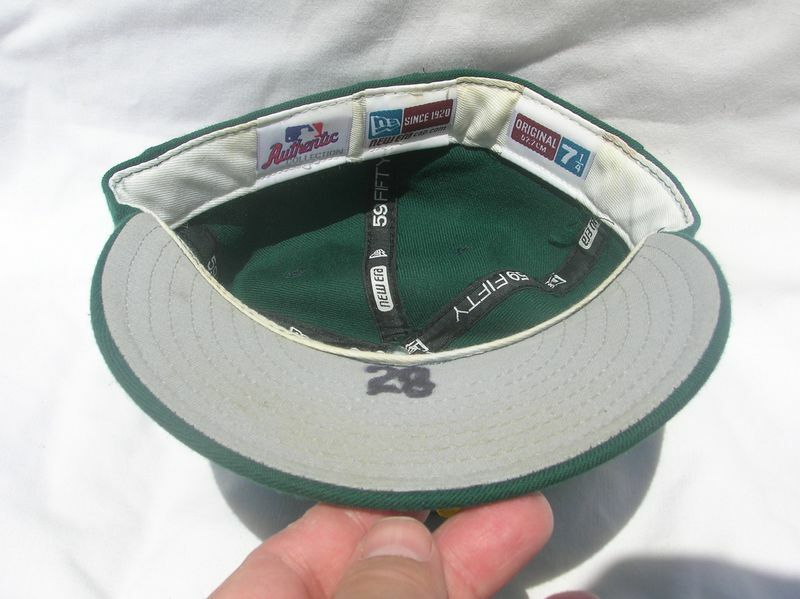 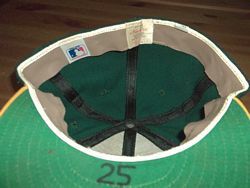 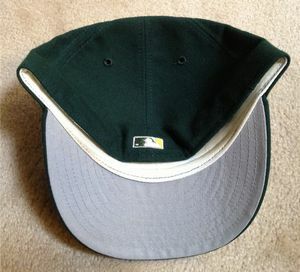 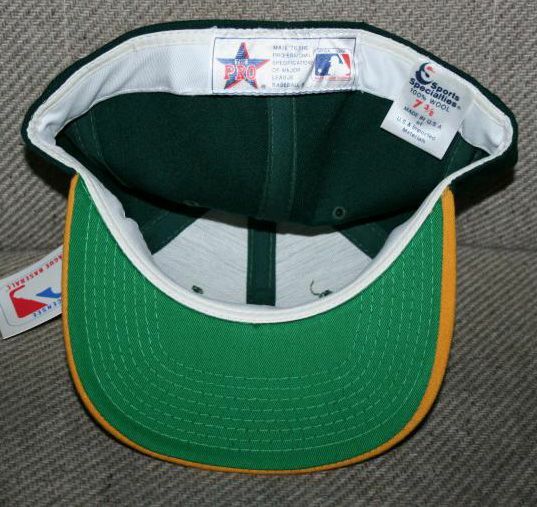 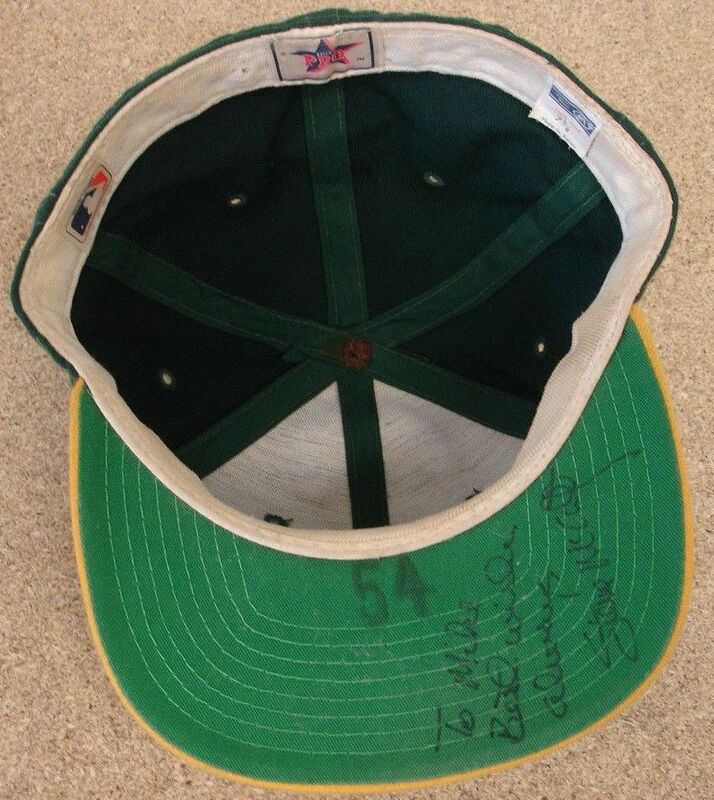 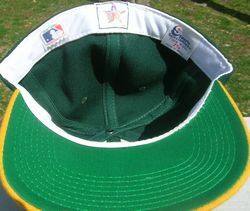 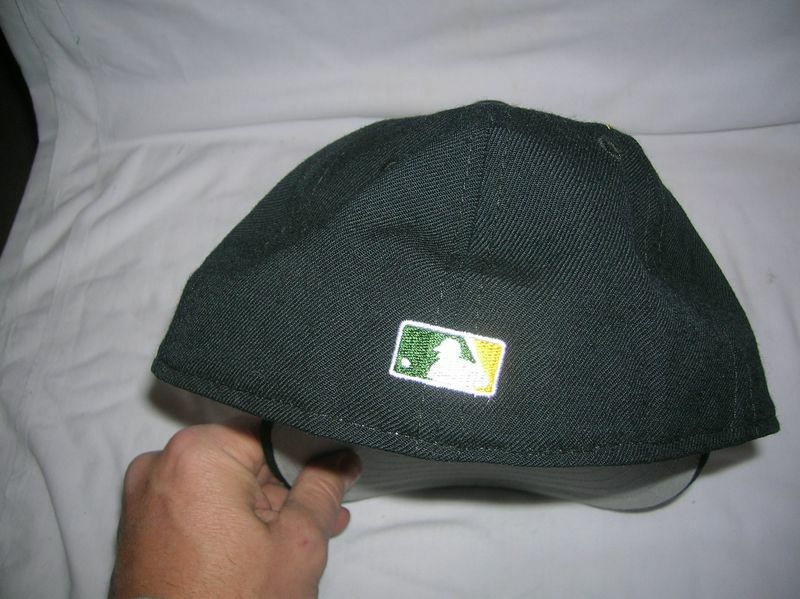 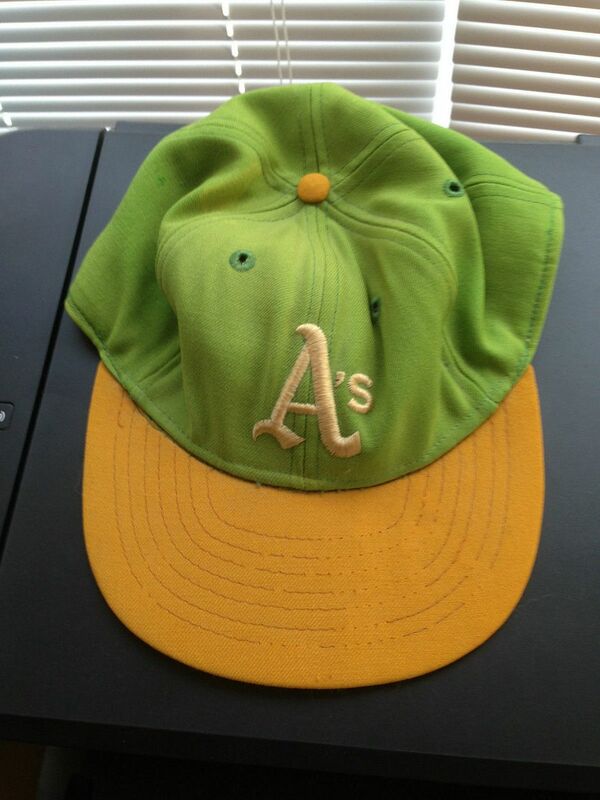 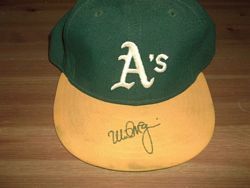 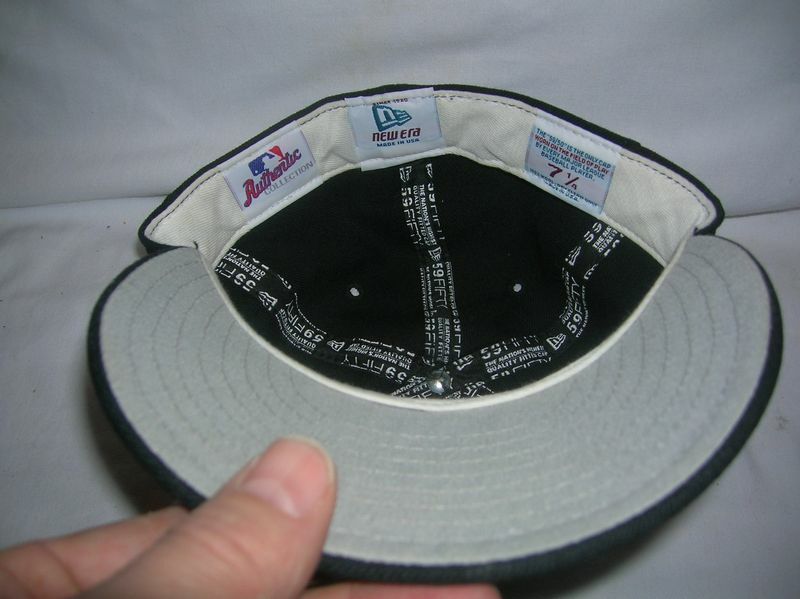 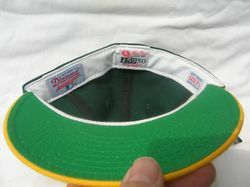 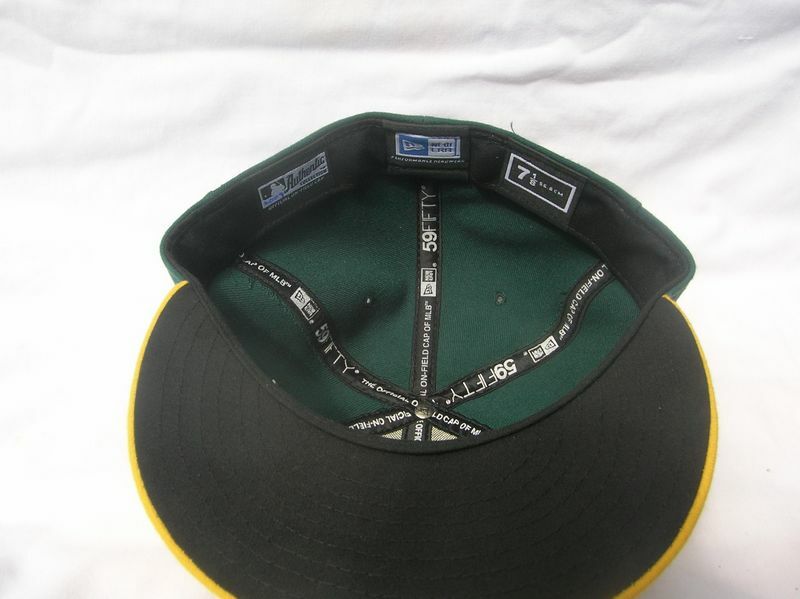 BTW MEARS sold this cap as a "1986 Canseco cap". 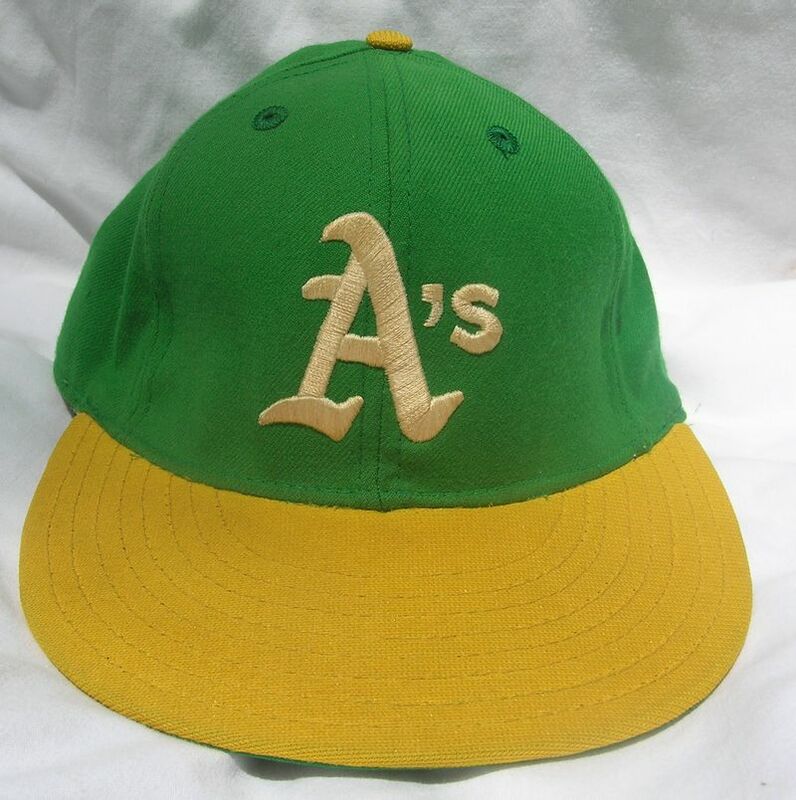 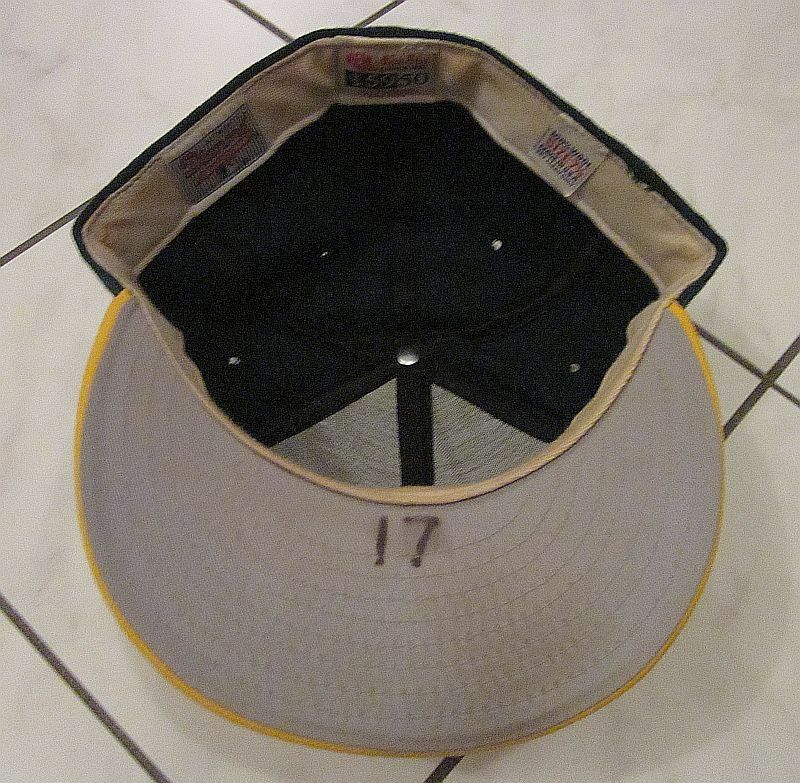 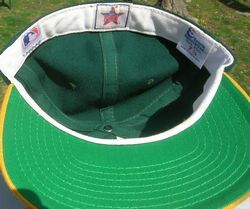 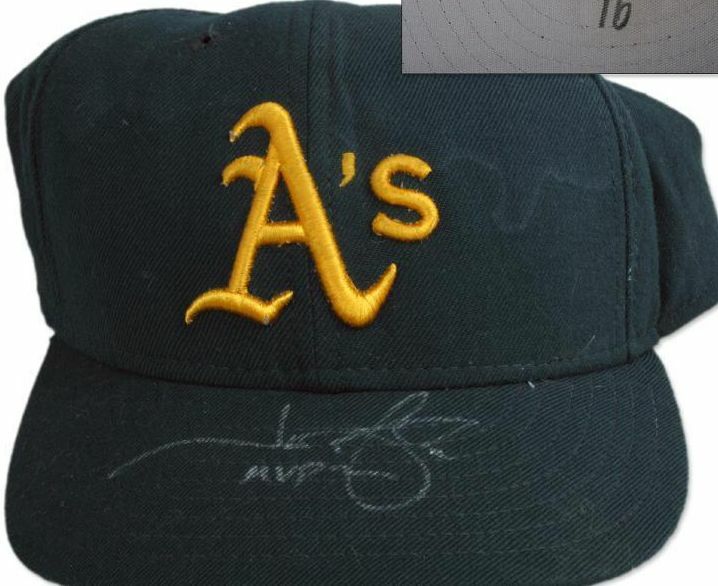 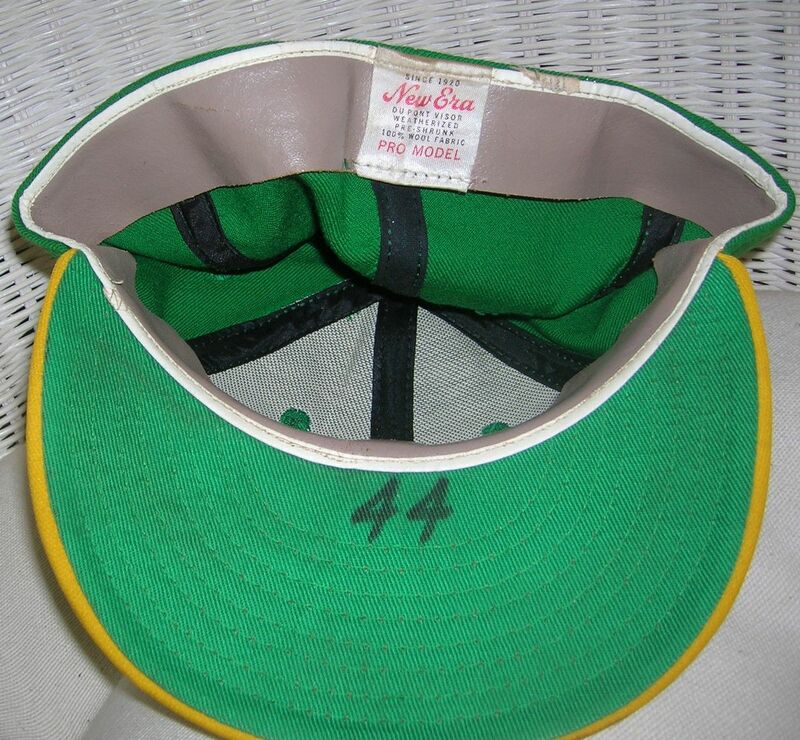 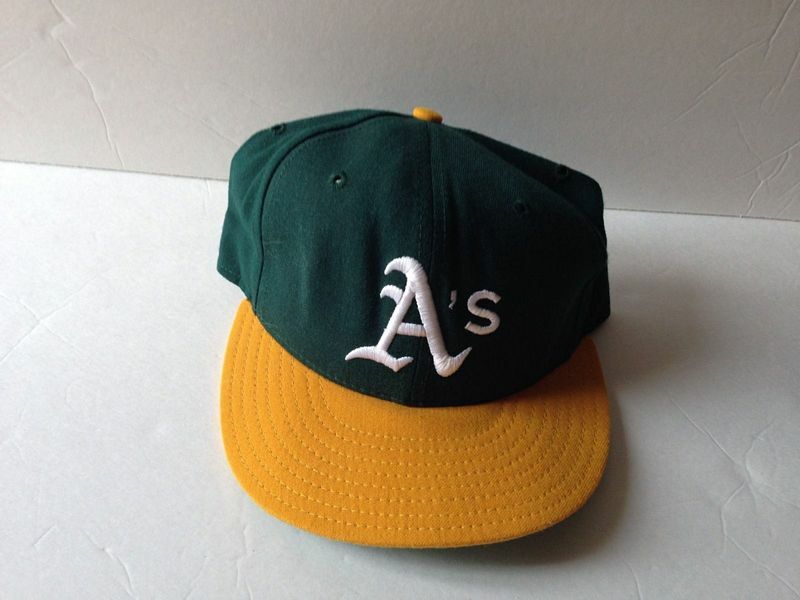 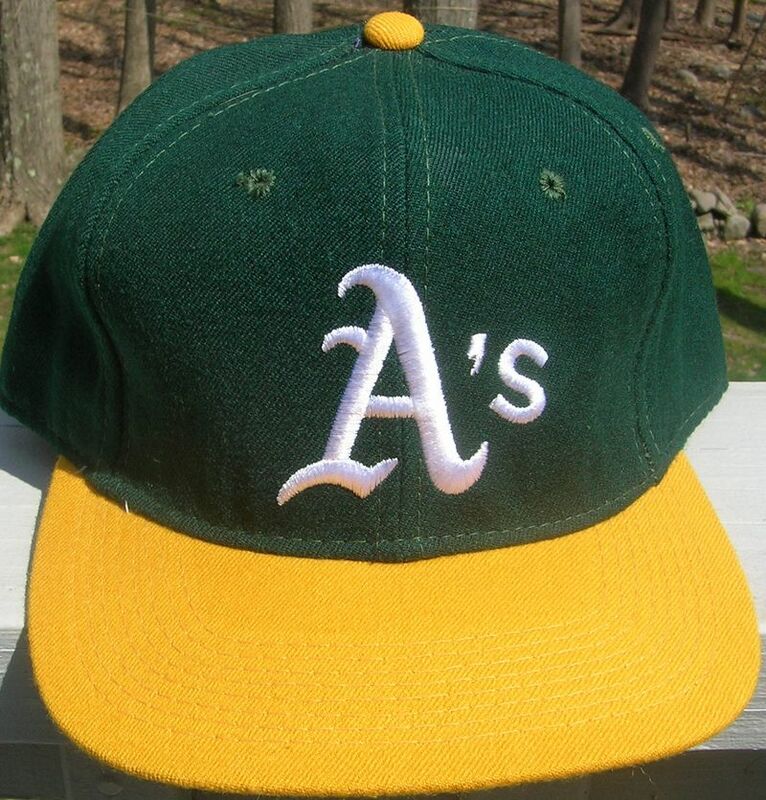 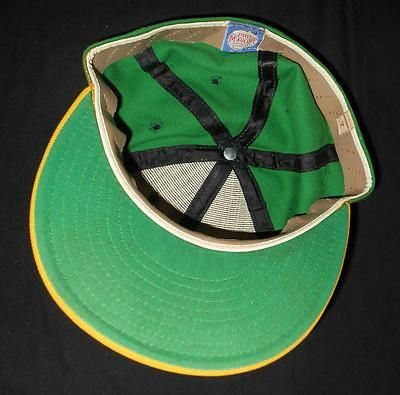 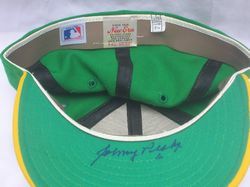 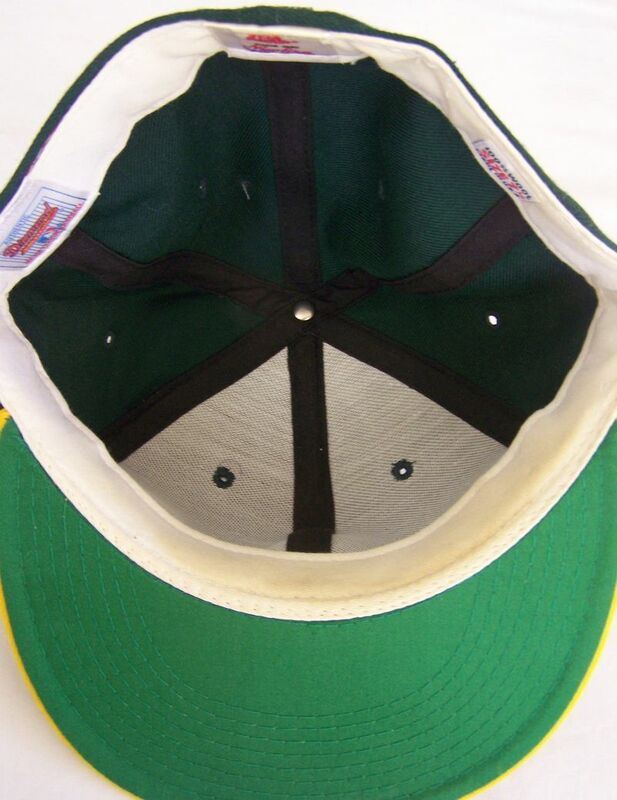 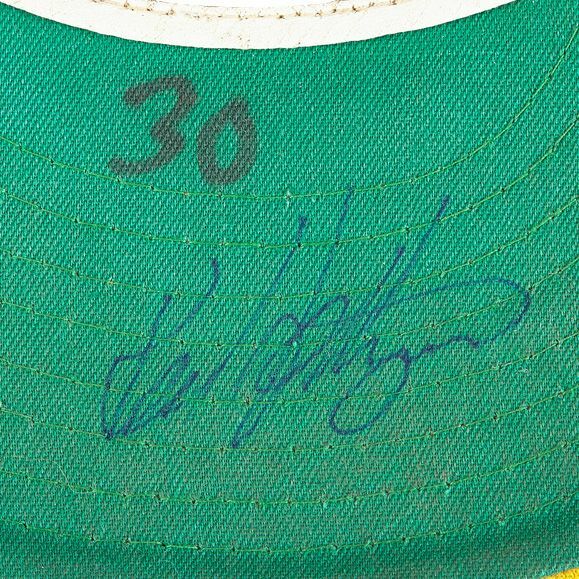 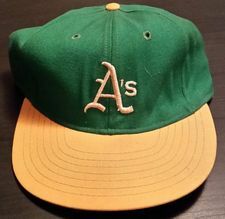 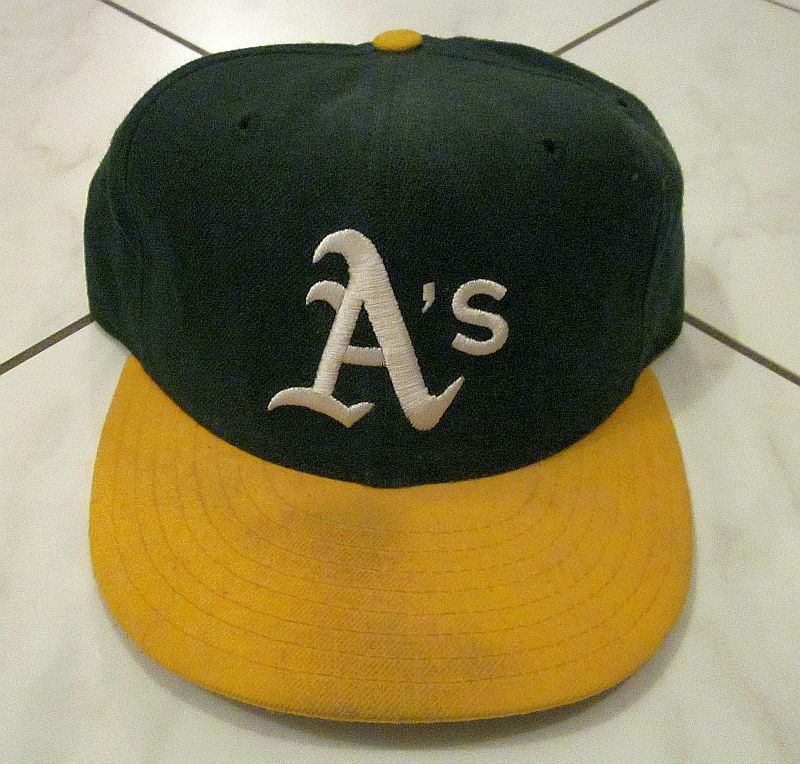 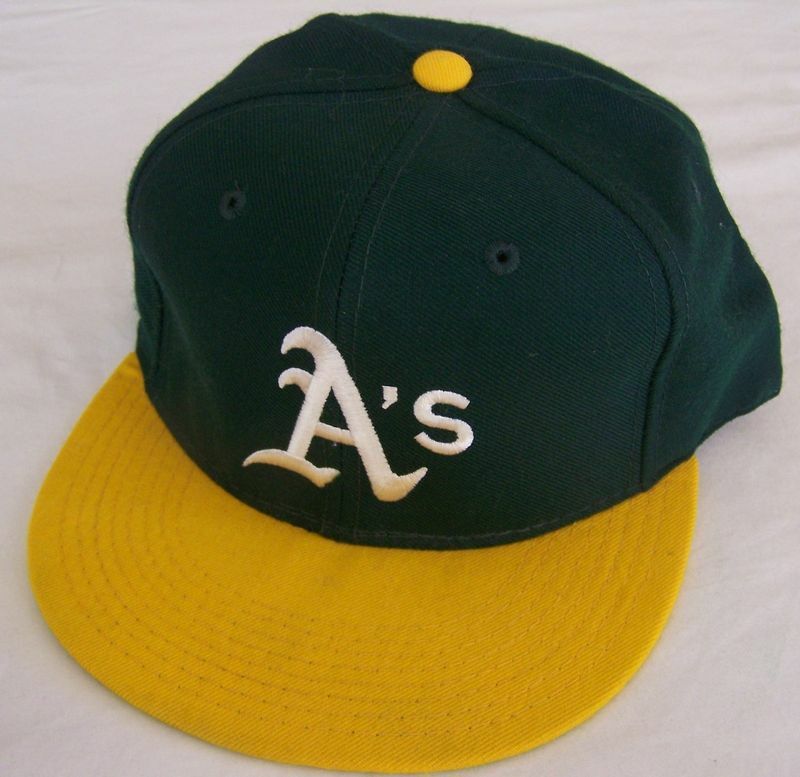 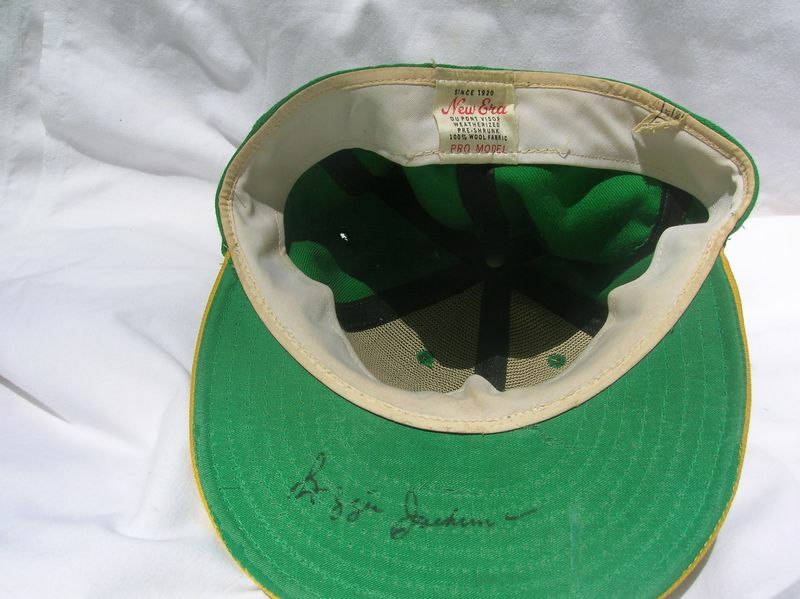 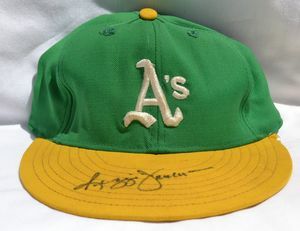 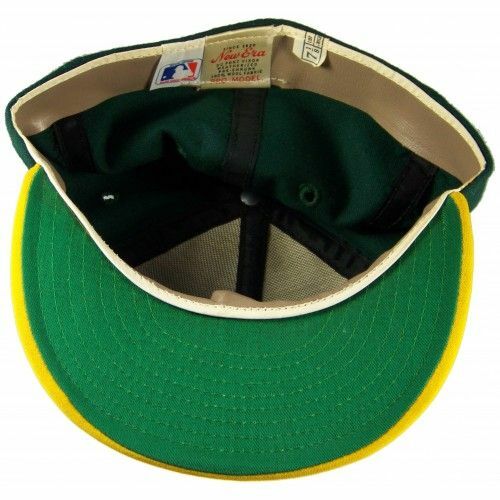 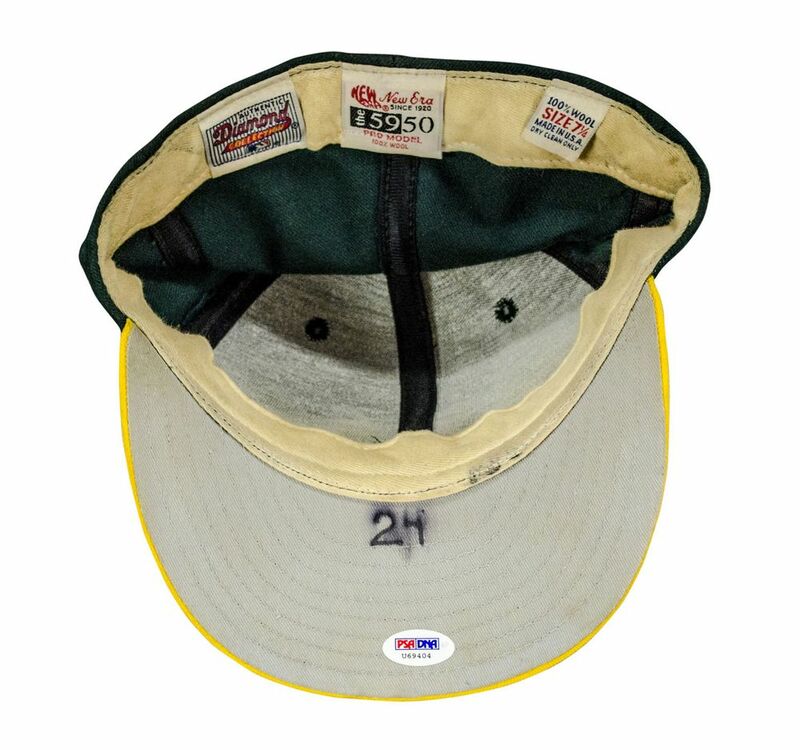 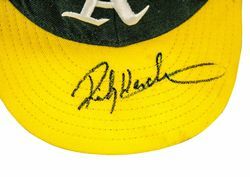 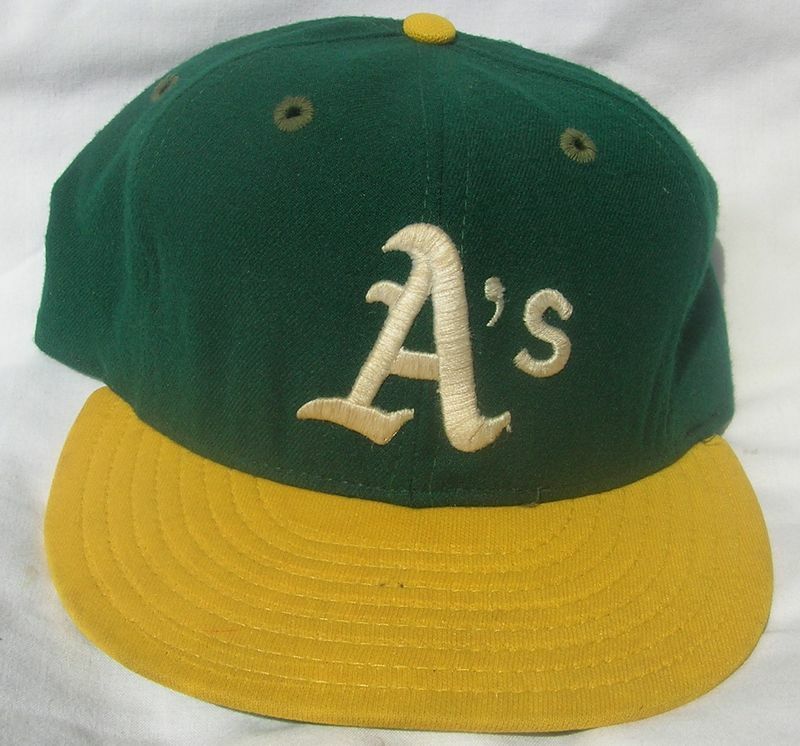 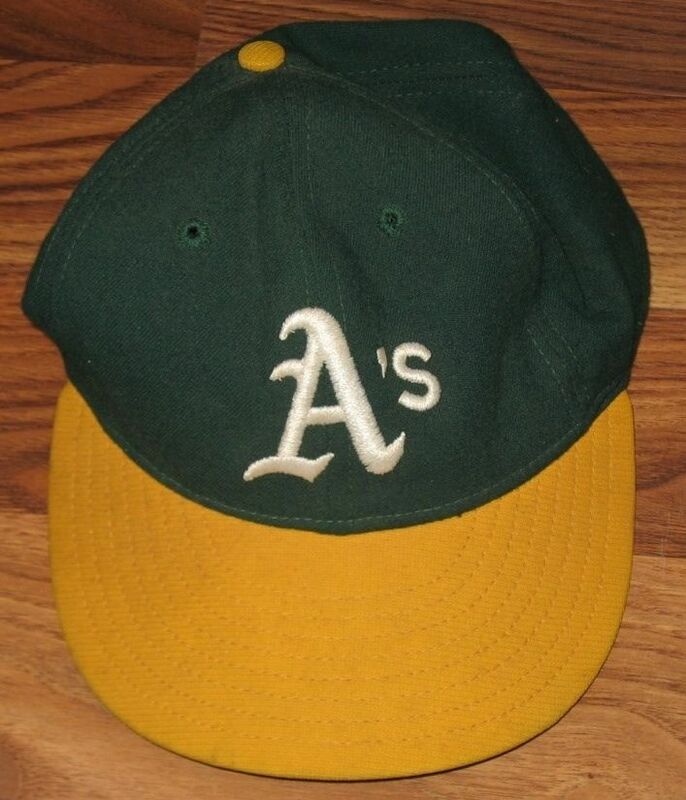 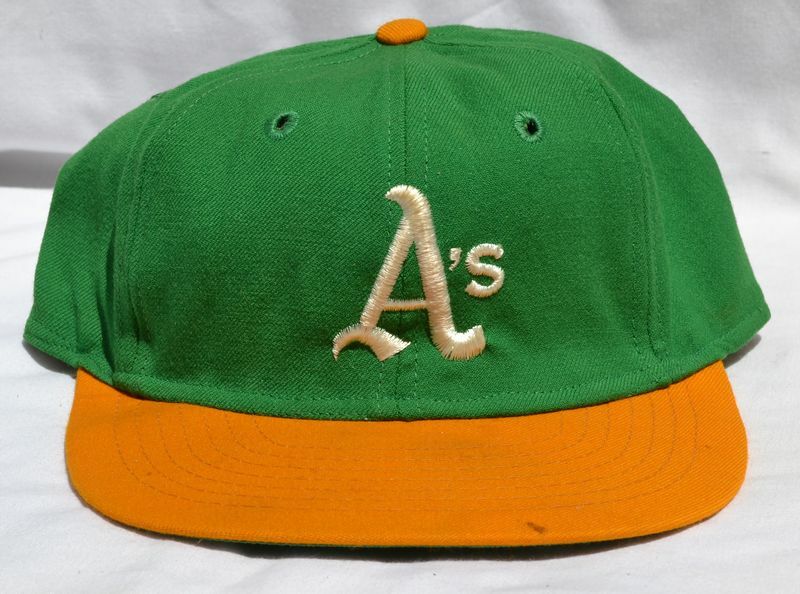 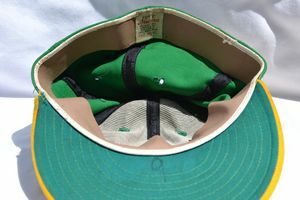 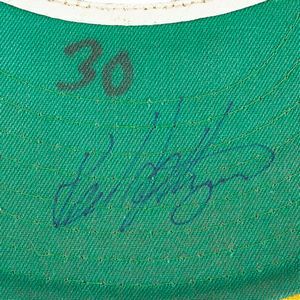 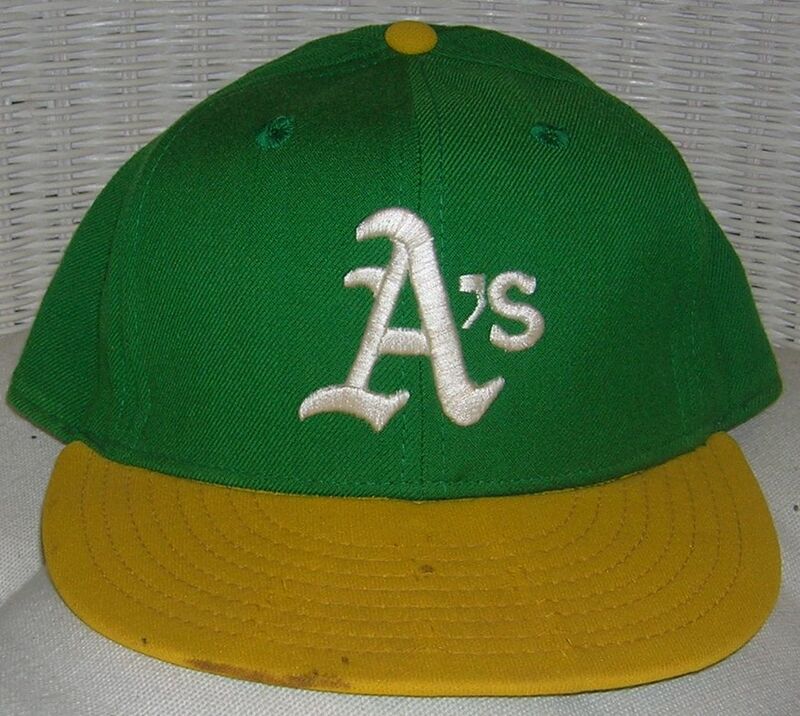 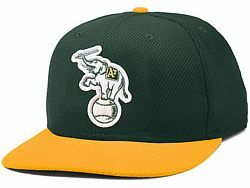 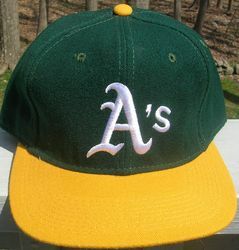 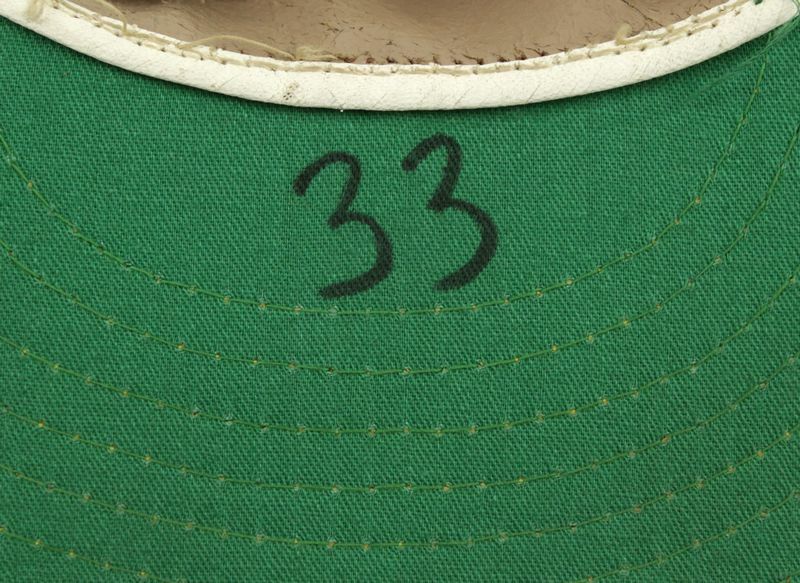 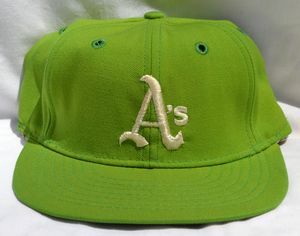 Sigh, where to start on that goof.... the team changed colors in 1982; Canseco wore size 7 1/2 or 7 5/8 not size 7.... in reality this is aDave Hamilton cap from the 1973-74 World Series years which is worth more than a 1986 Canseco would be. 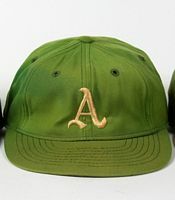 Do your research & don't trust auction houses. 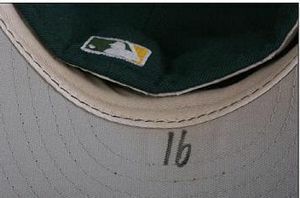 Exaggerated apostrophe and the "s" gets larger. 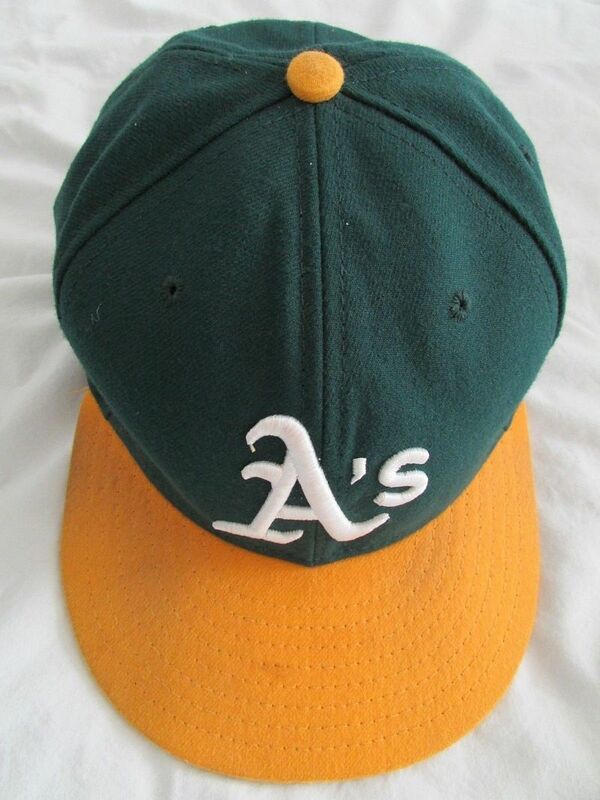 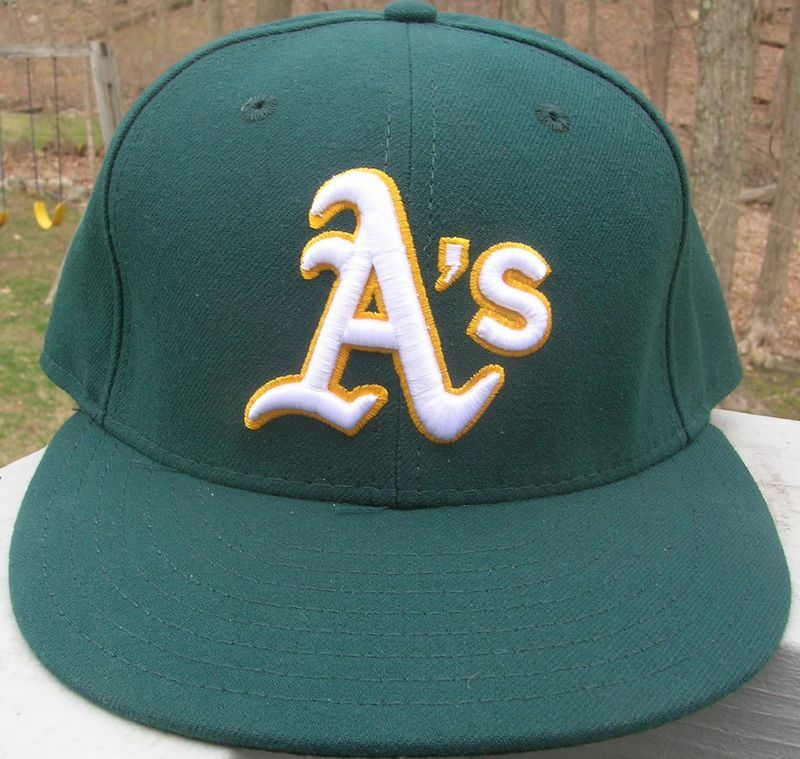 I've seen caps like this one sell for a fair bit whenever they pop up in auctions, so I'm compelled to advise, Oakland NEVER used this style KM Pro with this awful logo. 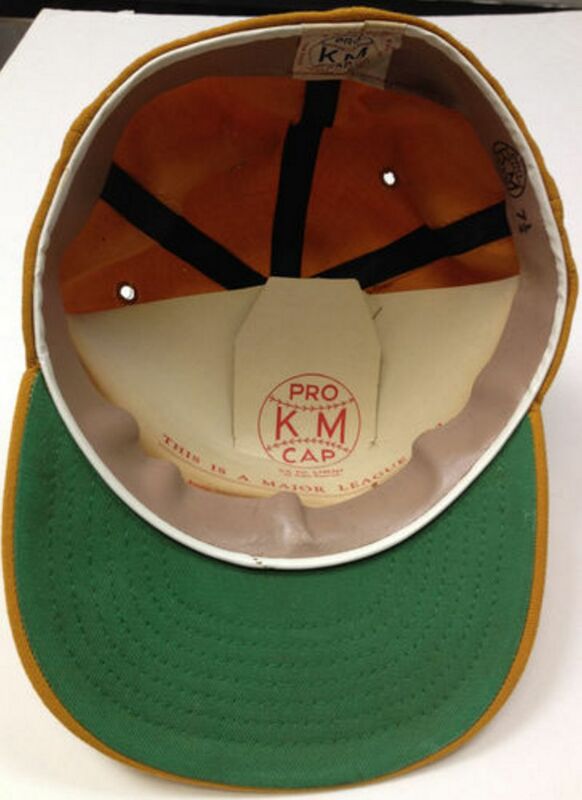 1971 was the last time they wore KM Pro. 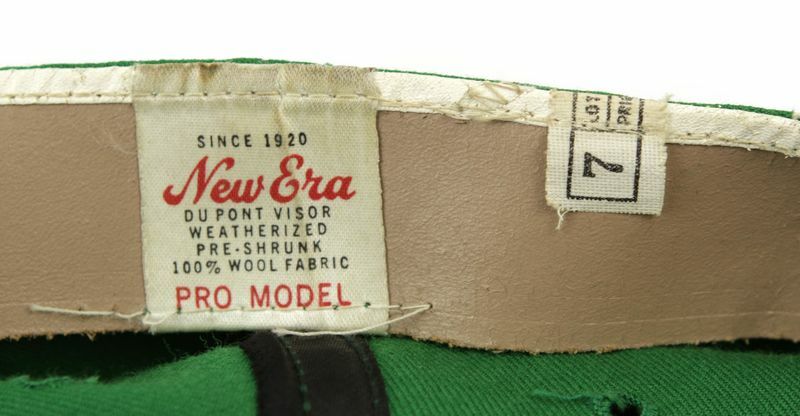 The serif points get sharper, the apostrophe smaller. Colors change to darker forest green and yellow. 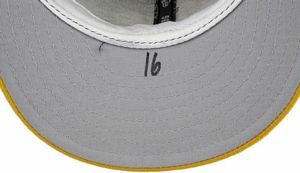 And the apostrophe gets larger again. Now the apostrophe is really thick. 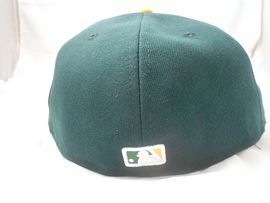 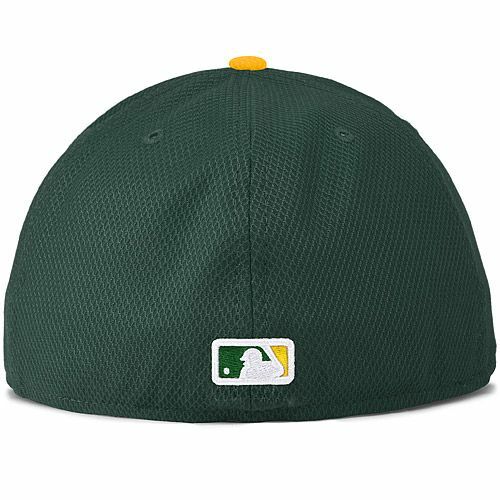 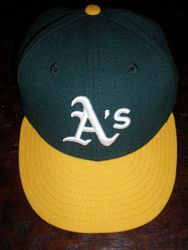 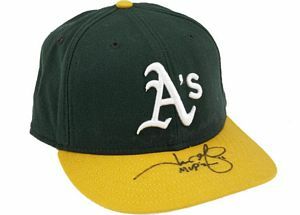 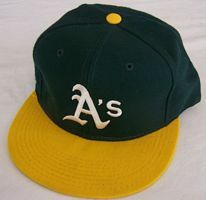 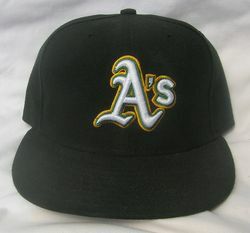 The logo gets sleeker as the A's use both Sports Specialties and New Era caps, though each capmaker has a slightly different look. 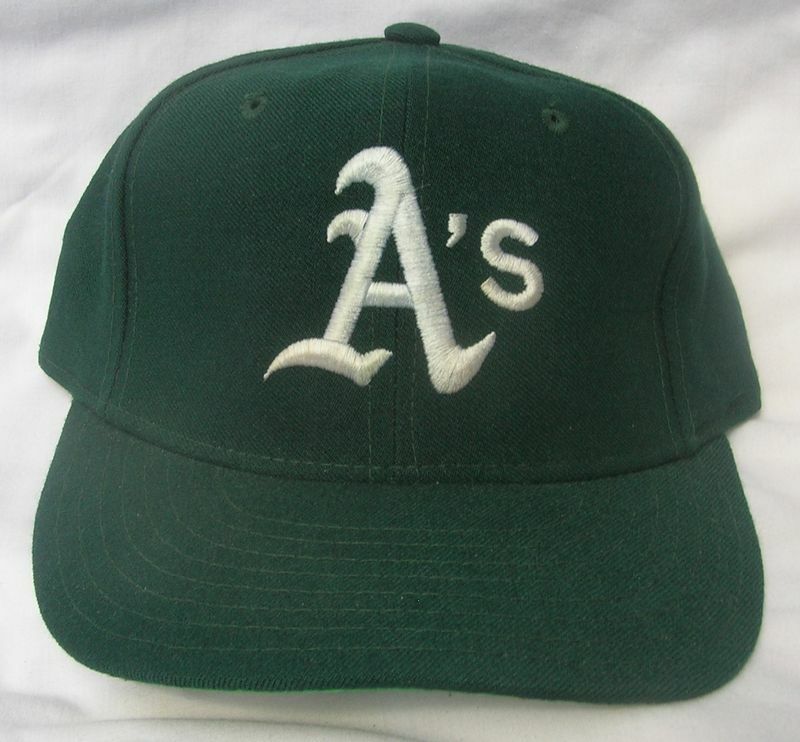 Around 1985, Oakland is one of the first teams to make Sports Specialties their main cap. 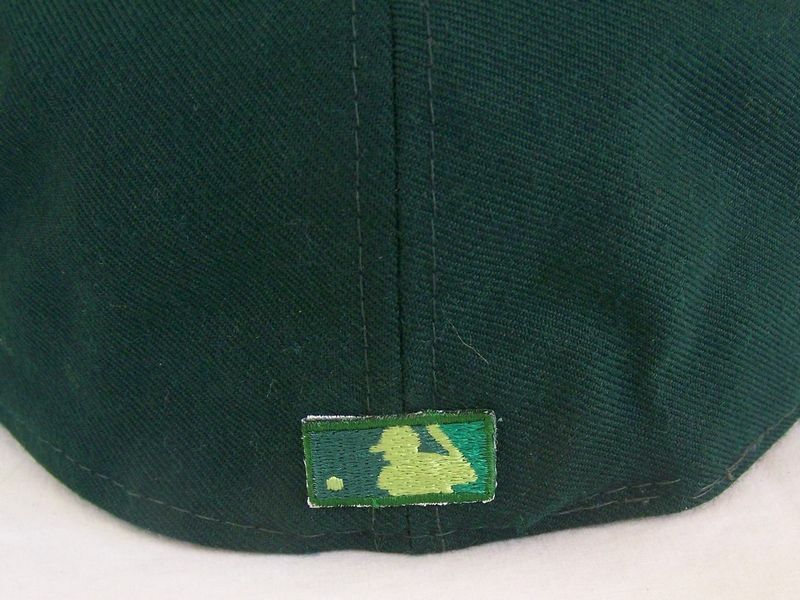 The logo gets just a tad thinner at the base of the A (left side). 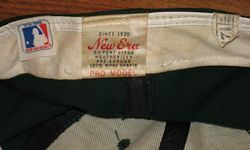 Most players use Sports Specialties but some still wear New Era. 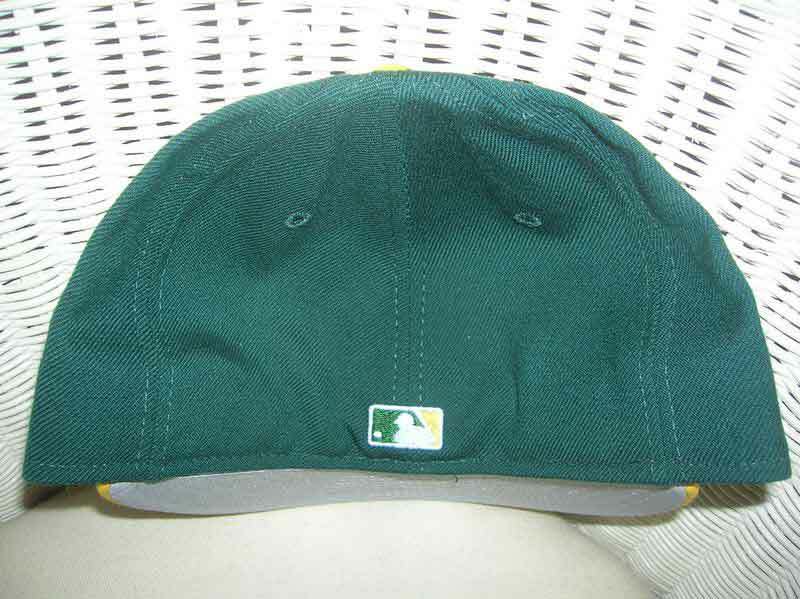 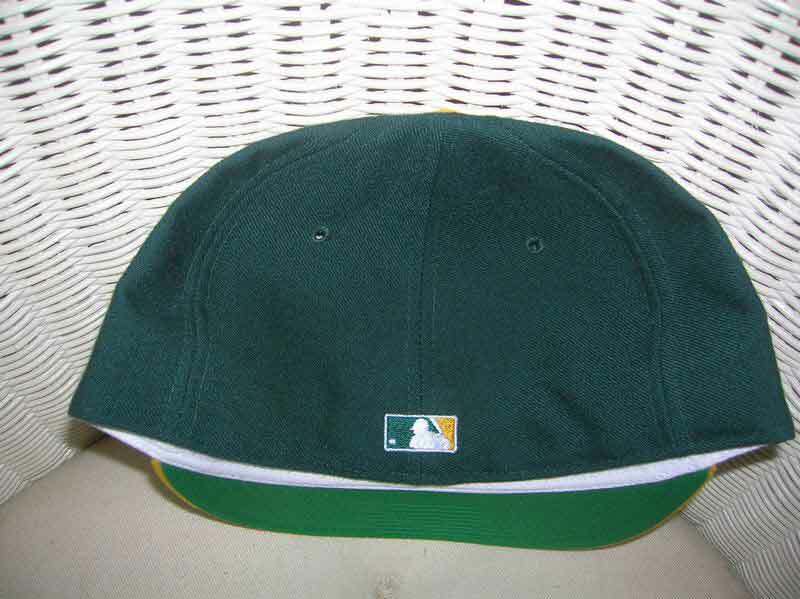 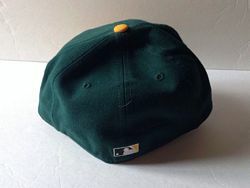 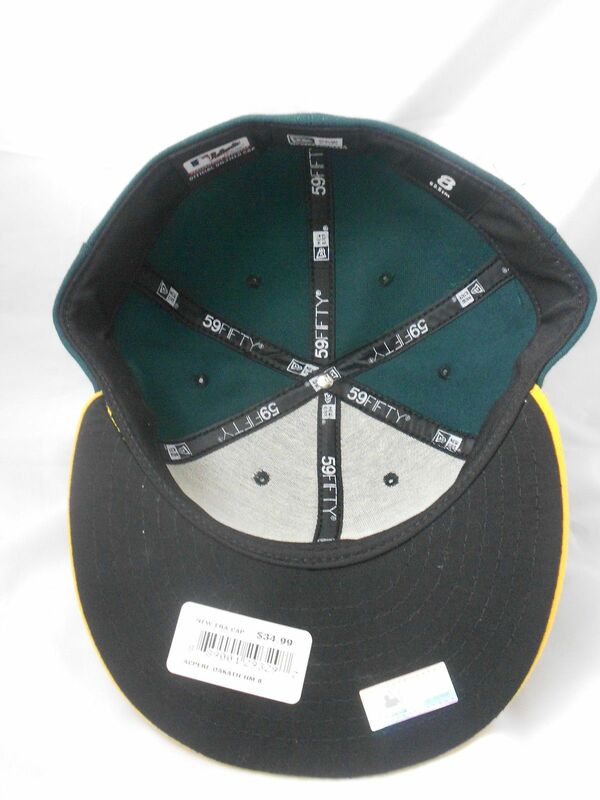 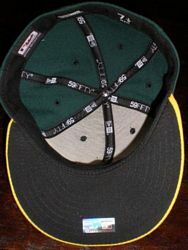 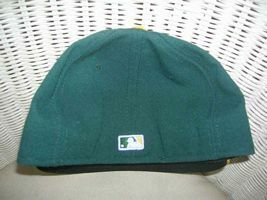 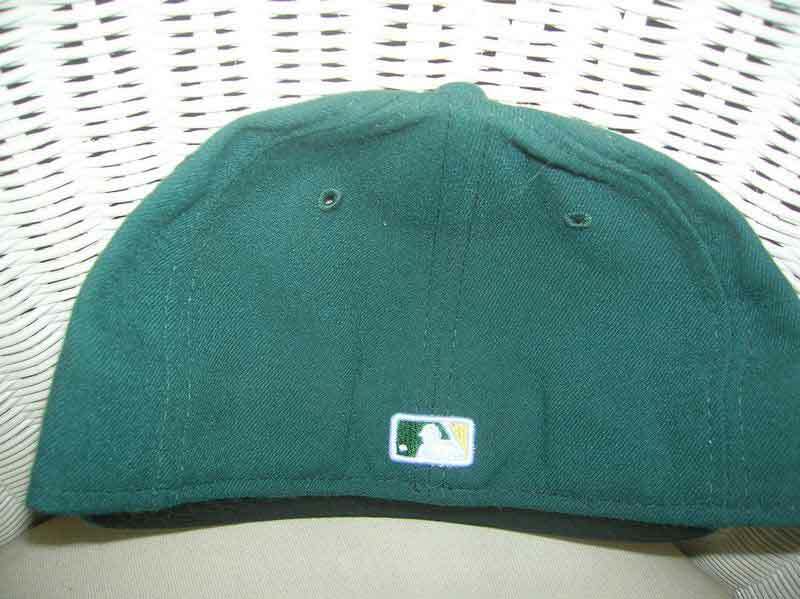 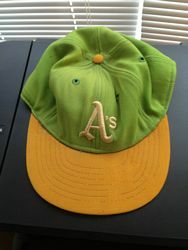 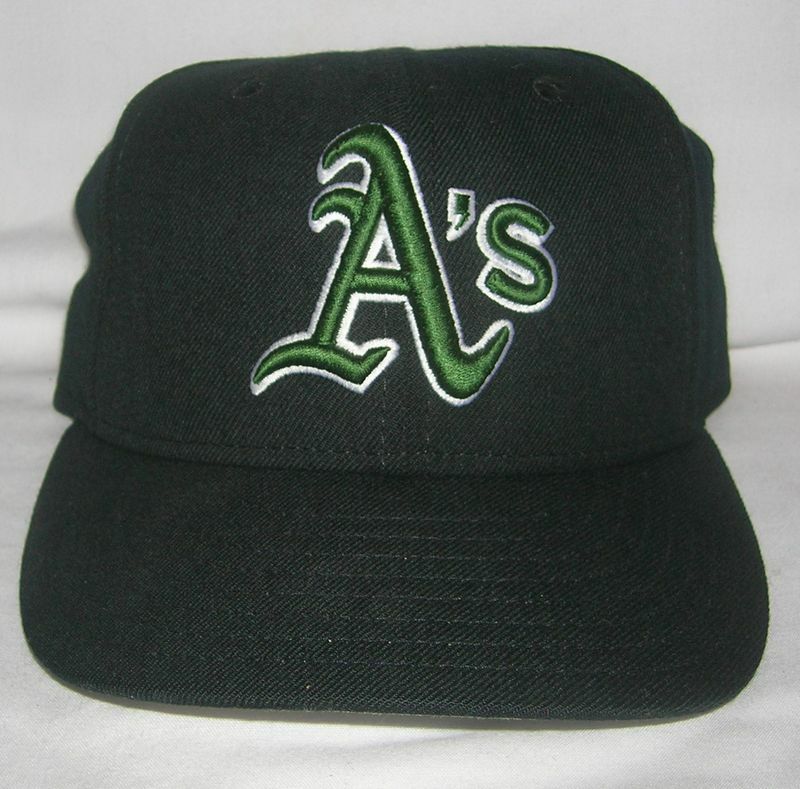 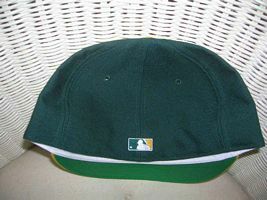 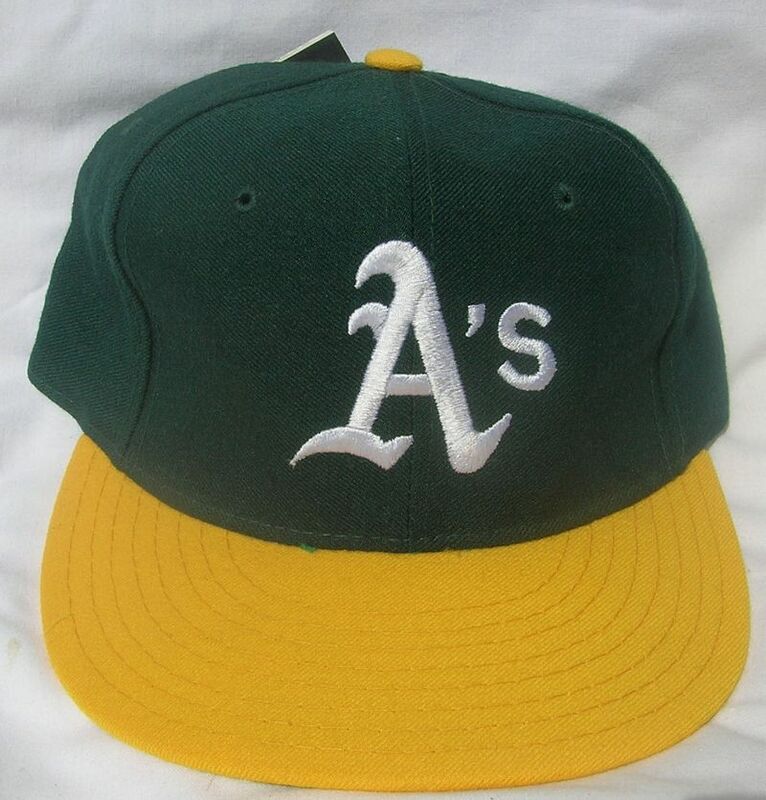 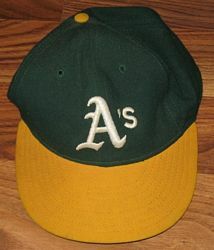 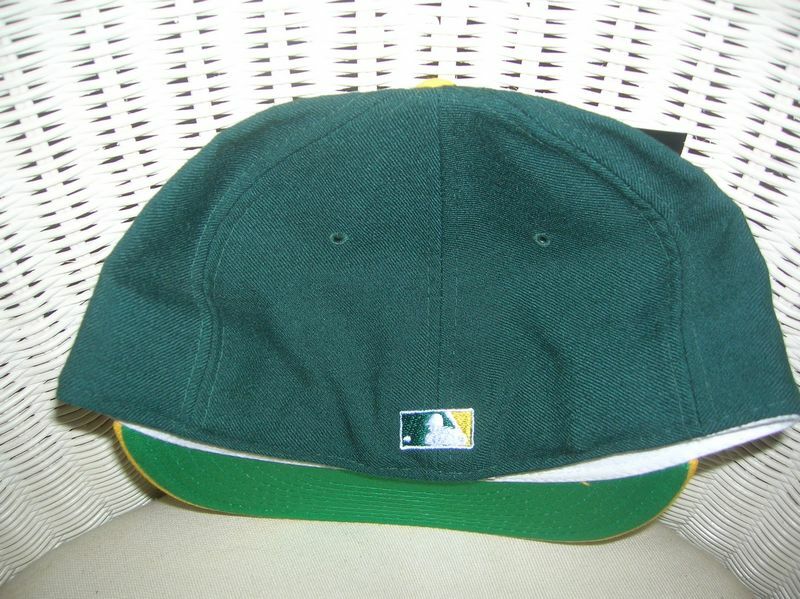 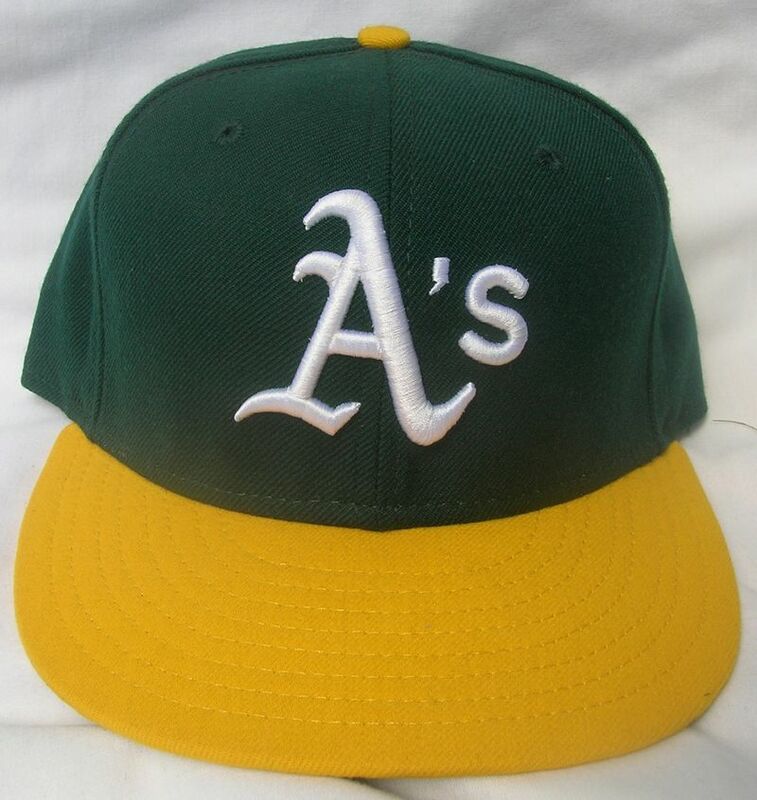 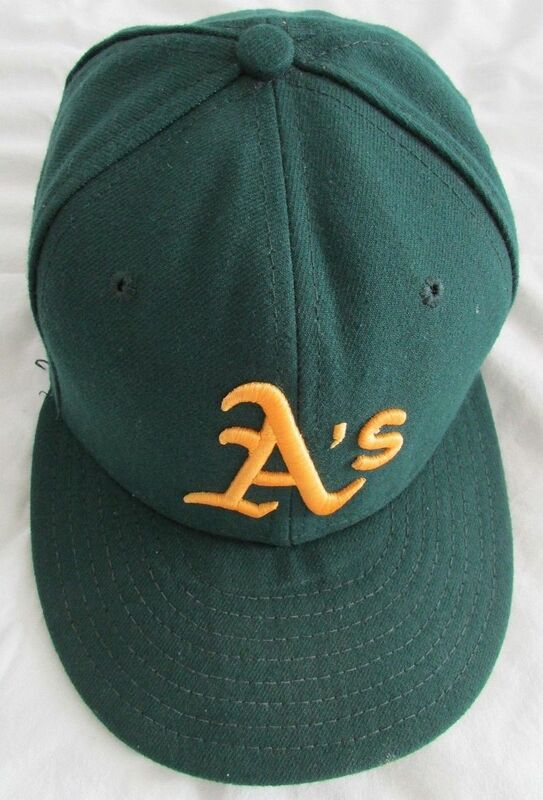 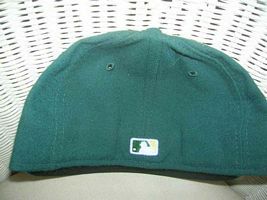 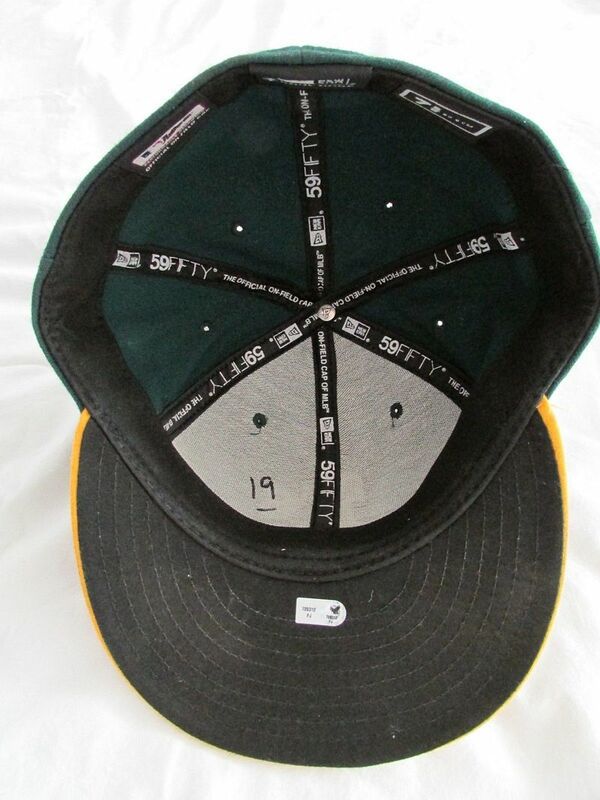 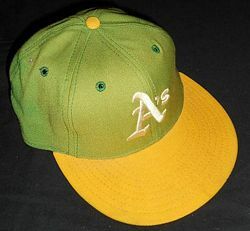 The A's now wear New Era caps almost exclusively. ...then is embroidered on later in the year in team colors. 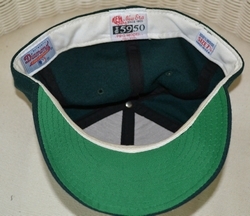 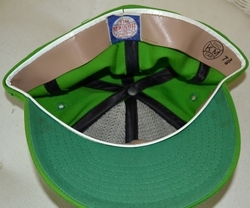 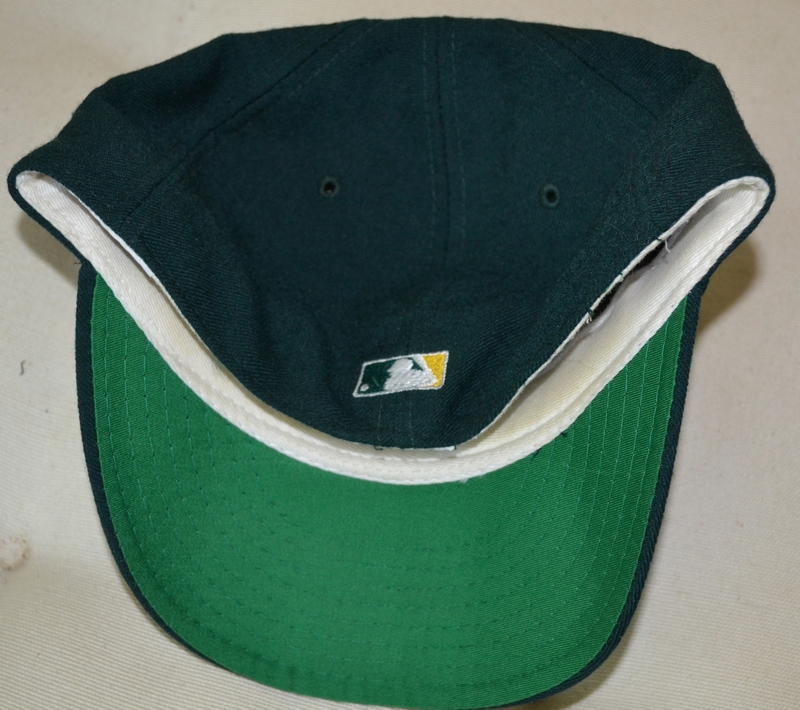 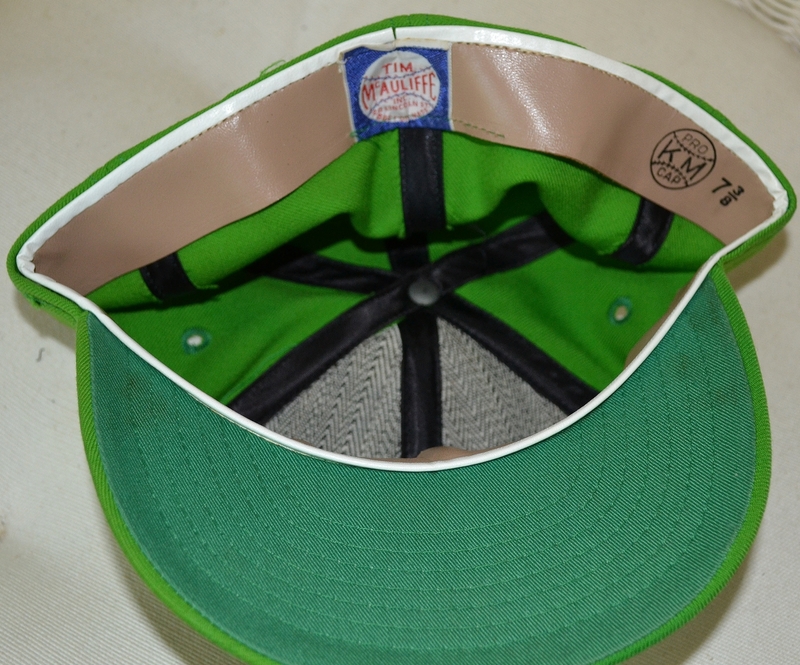 All-green road cap debuts in 1993. Grey underbrims are used by some players. 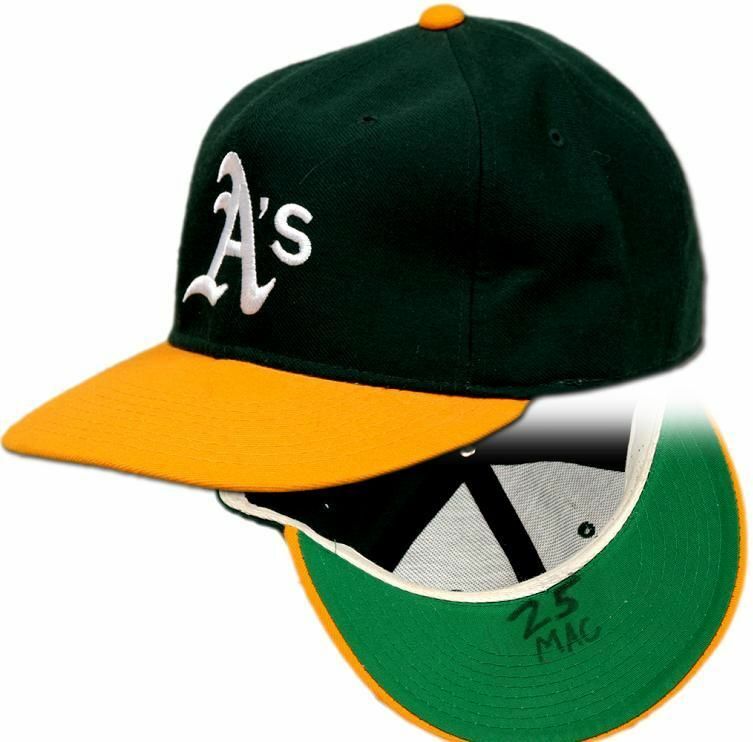 Road cap logo changes to gold. 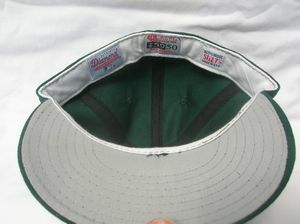 Undervisors are all grey by 1995. 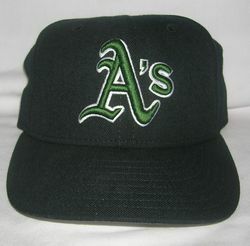 In recognition of the 100th anniversary of the Athletics, a black jersey and cap is used as an alternate. 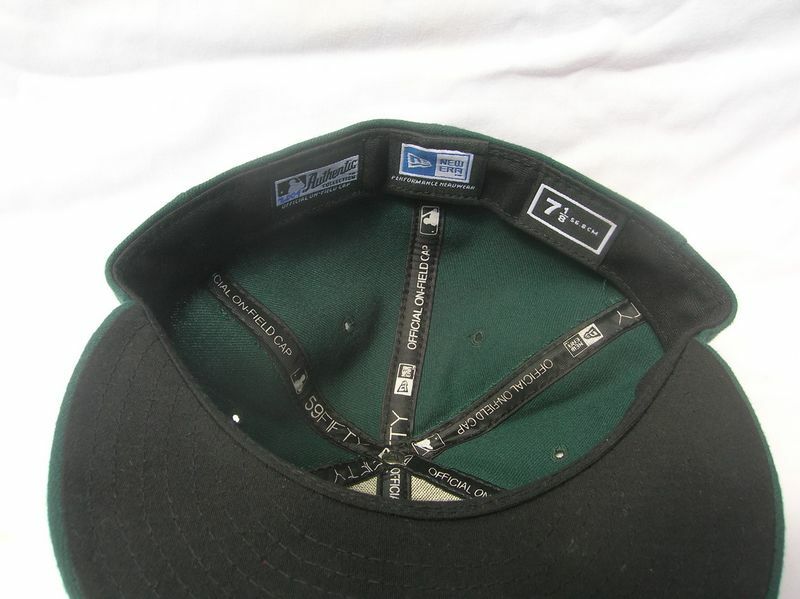 I'm still looking for 2000 home and road caps with the same "Authentic" tag. 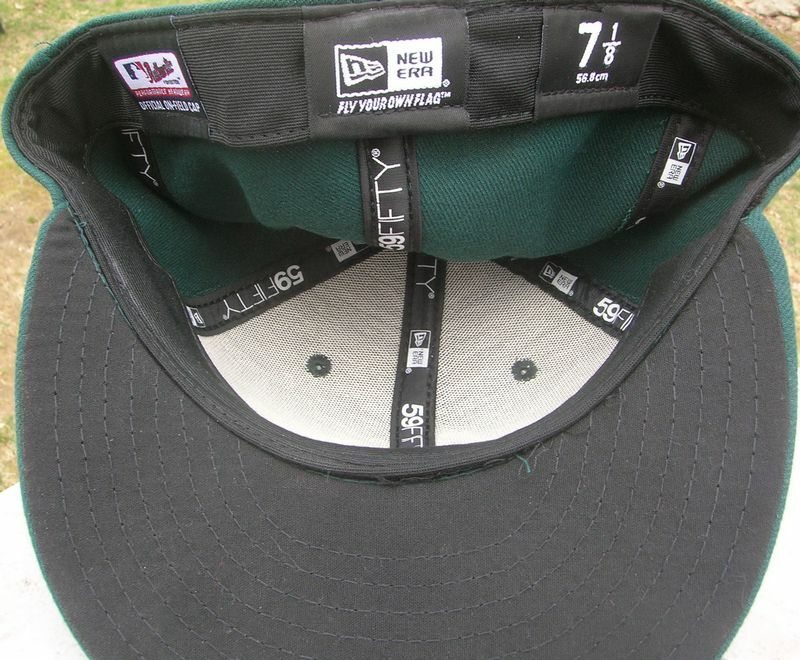 After 2000 the black cap is retired from on-field use but remains an official alternate. 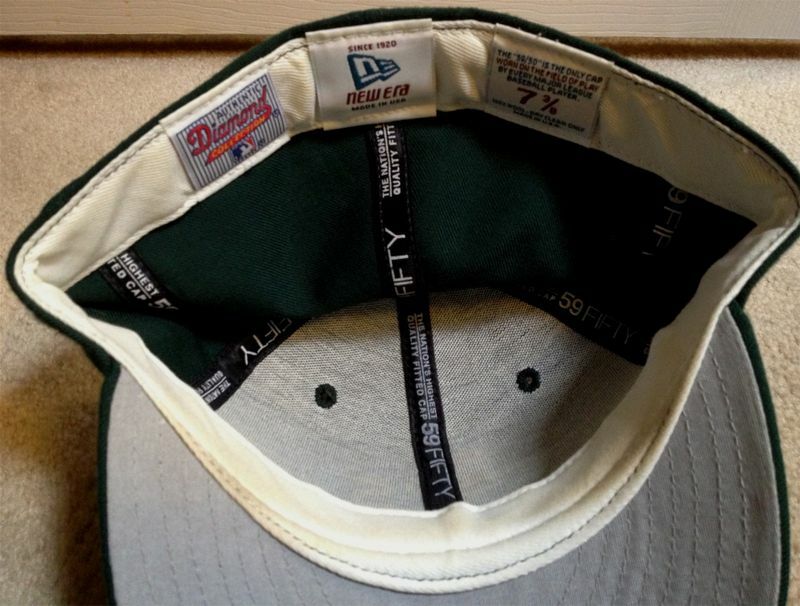 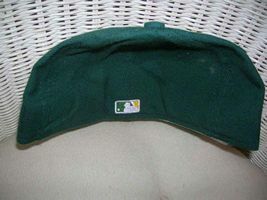 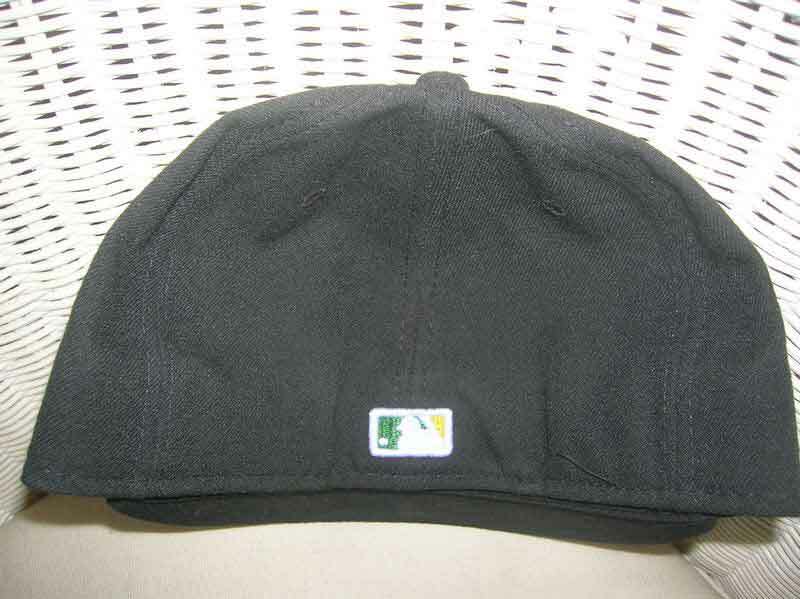 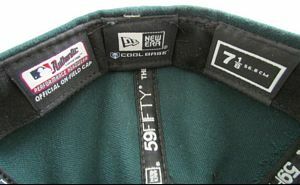 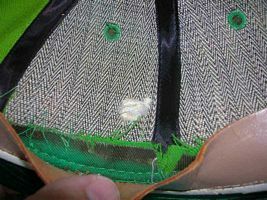 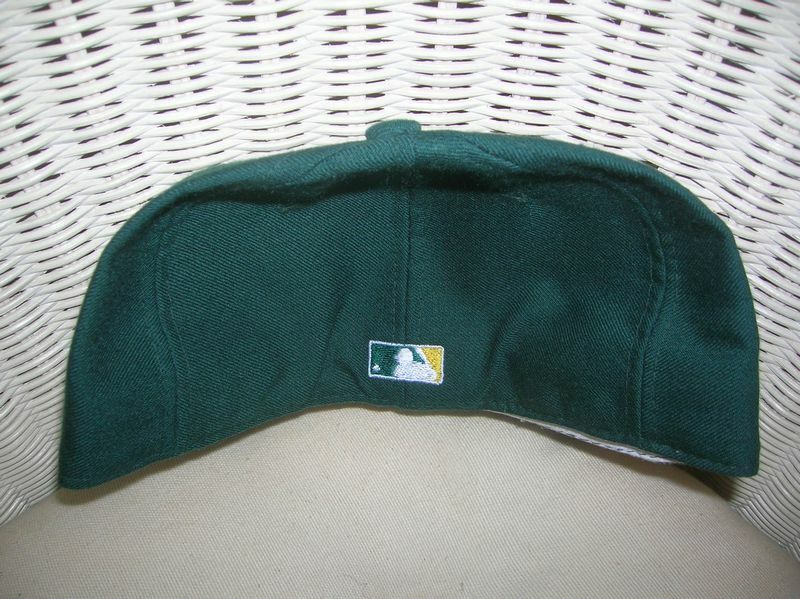 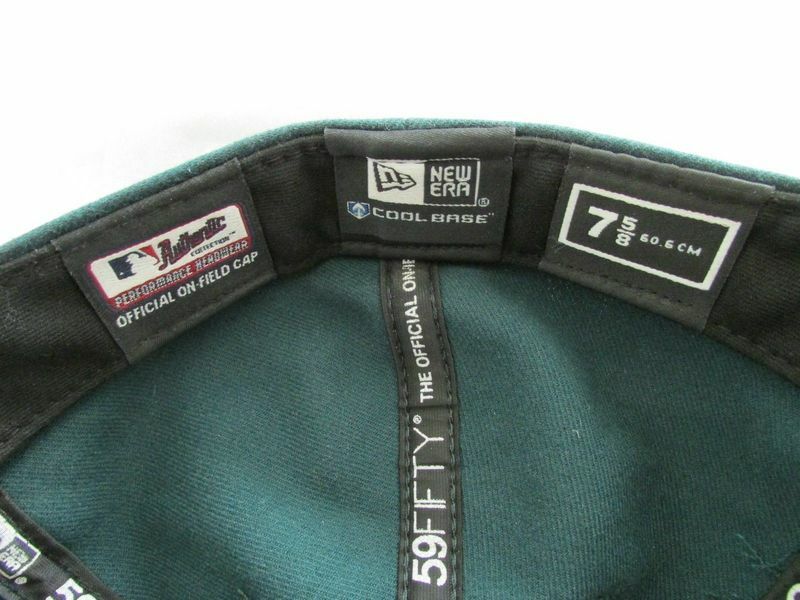 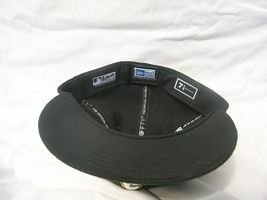 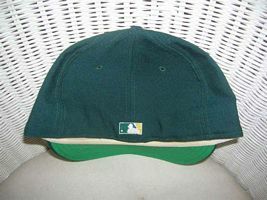 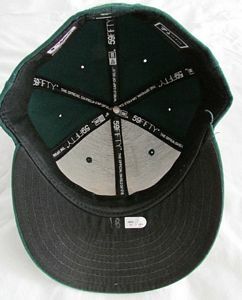 Caps become polyester with black underbrims. 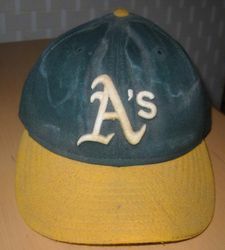 BP cap worn a few times. 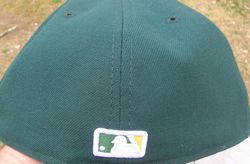 New road cap debuts. 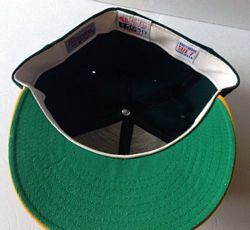 BP cap not used.